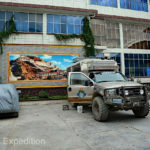 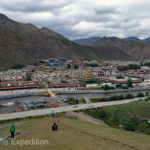 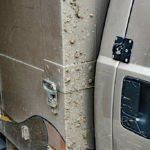 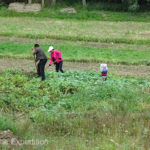 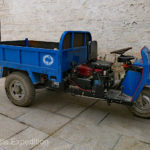 After our exciting drive, following muddy switchbacks down the mountain in the dark to Xiahe, we were just happy that Green knew a pleasant hotel, the Tara Guesthouse, she had stayed at before and it had a quiet courtyard for us to park and camp. 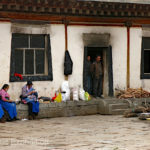 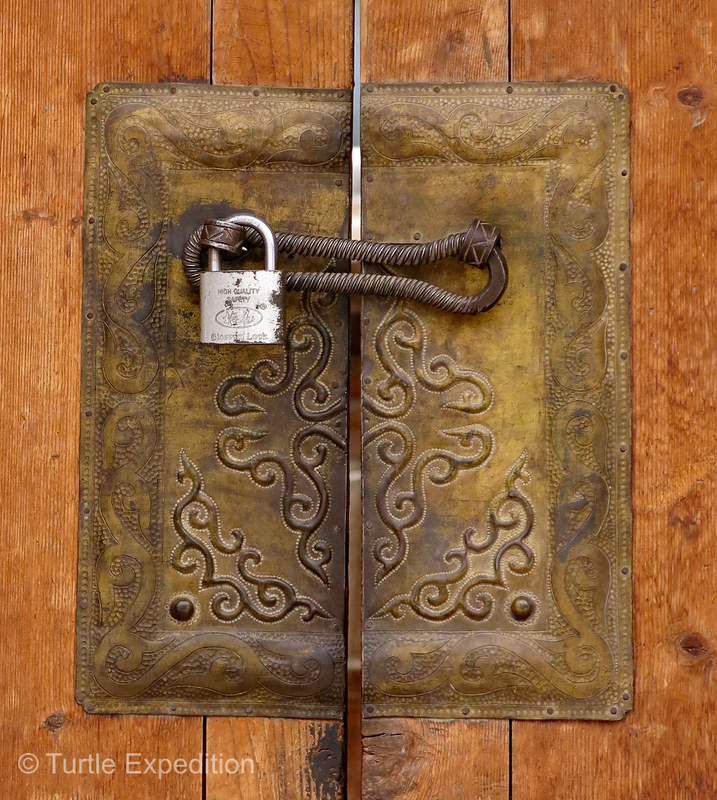 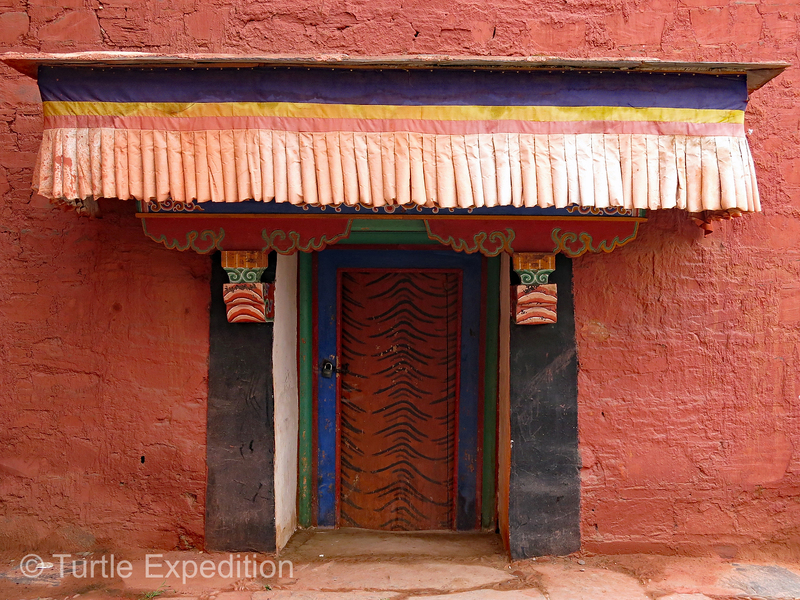 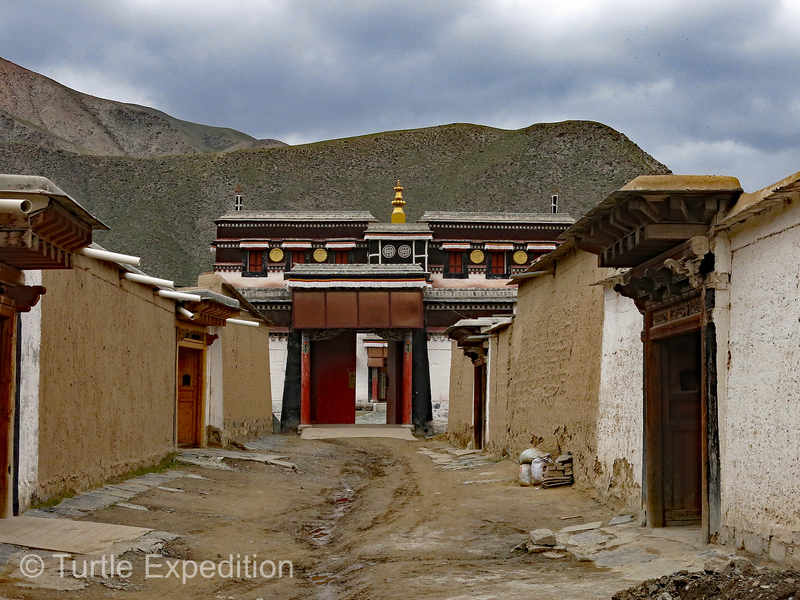 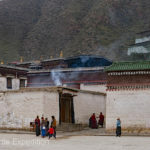 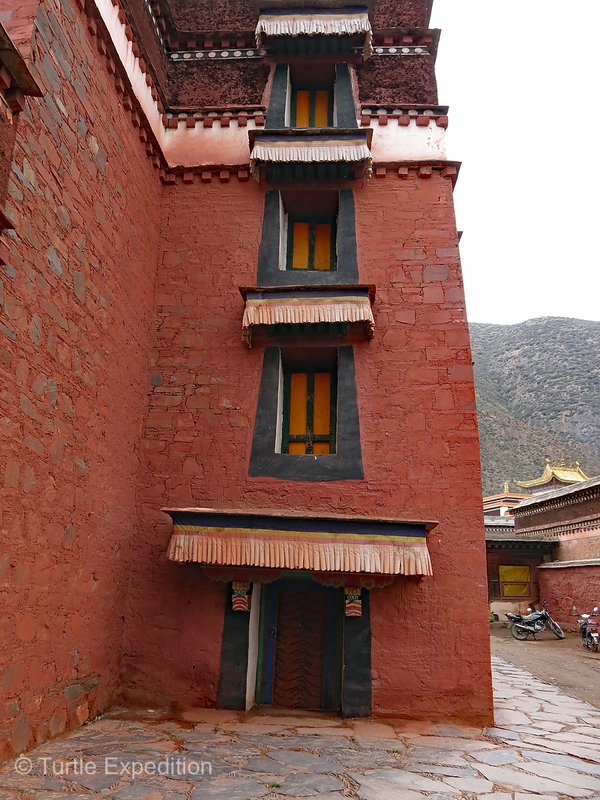 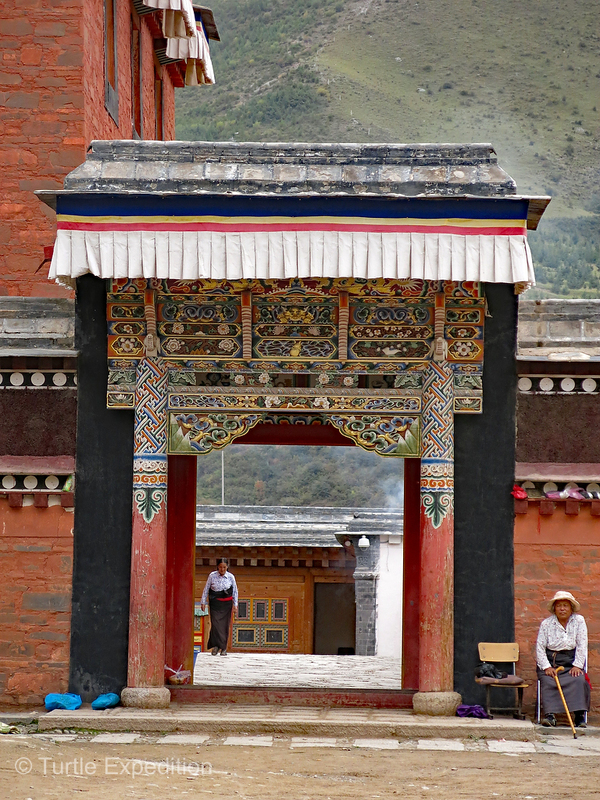 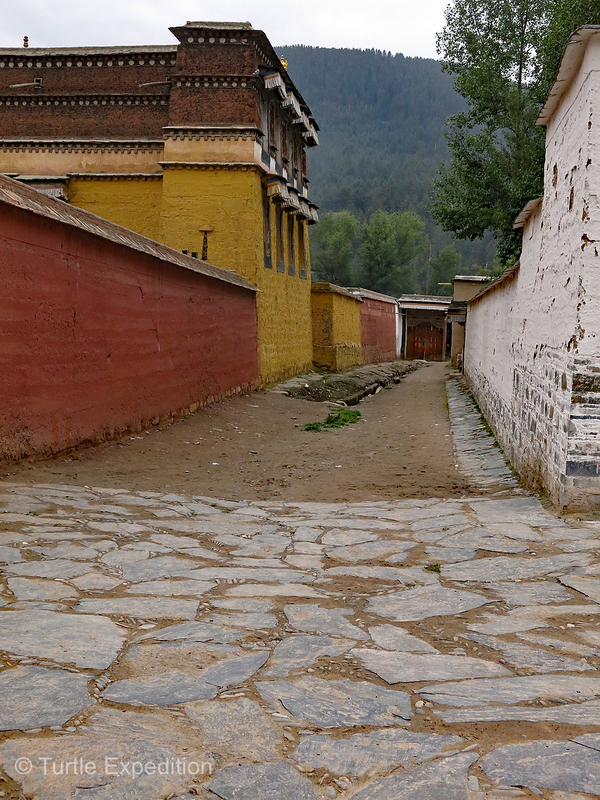 In the morning, we were a 5-minute walk to the entrance of the Labrang Monastery. 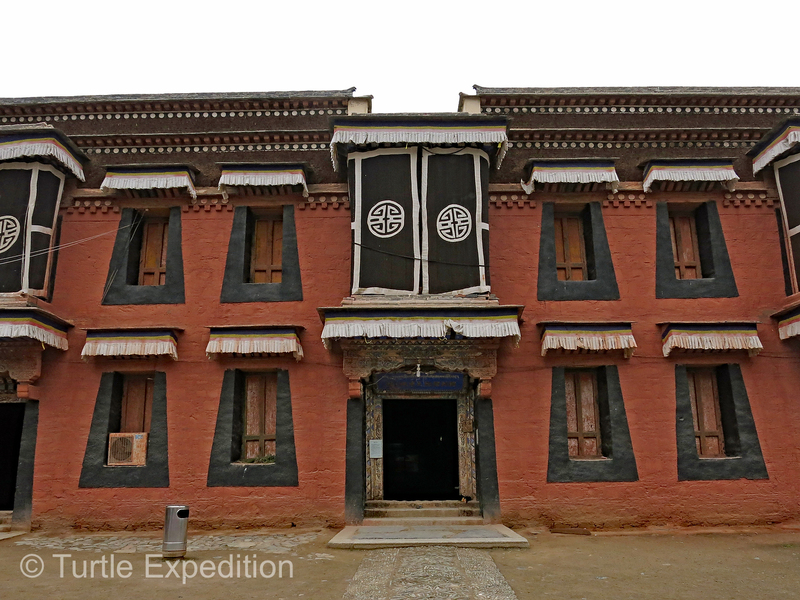 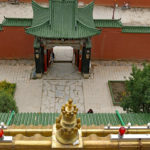 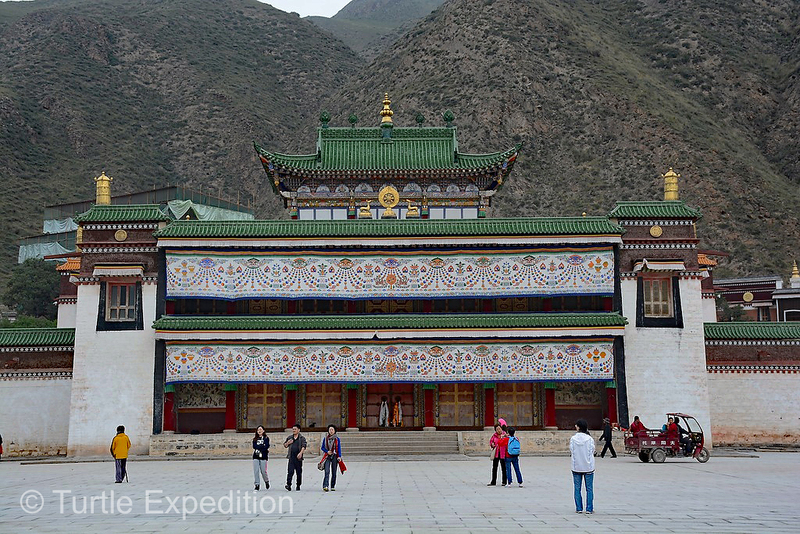 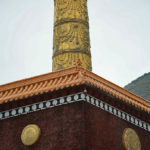 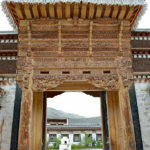 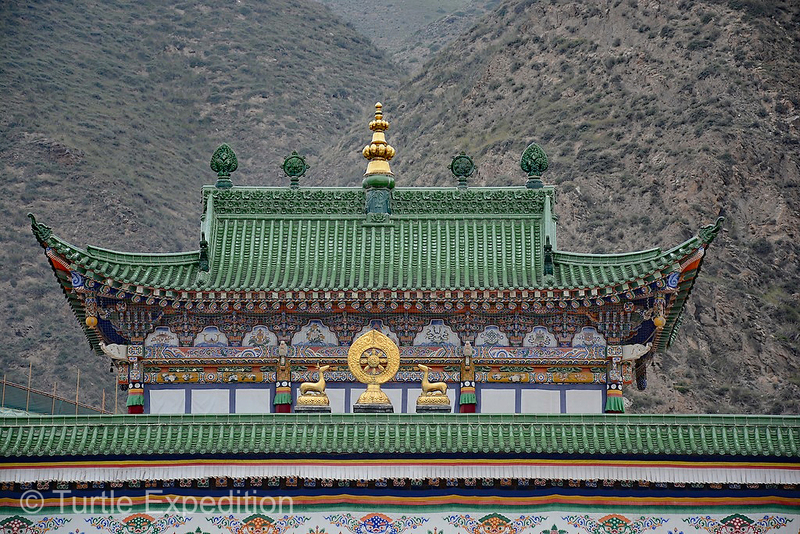 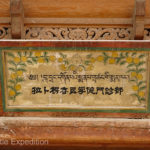 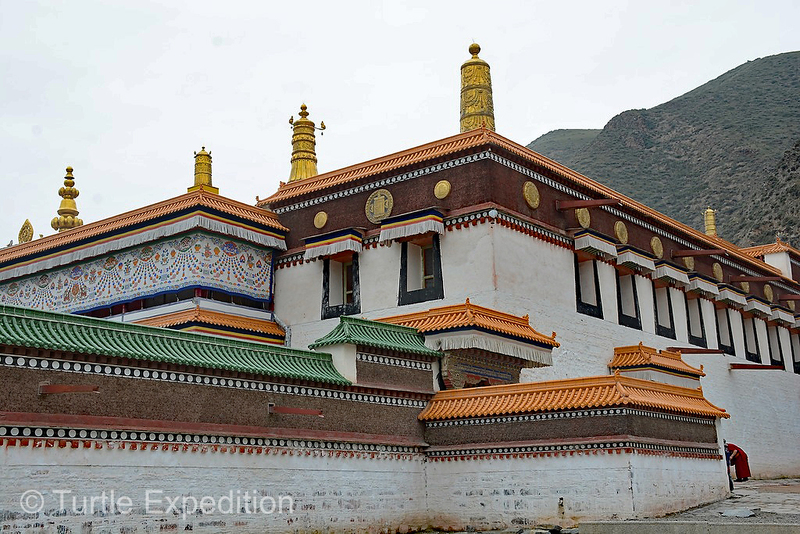 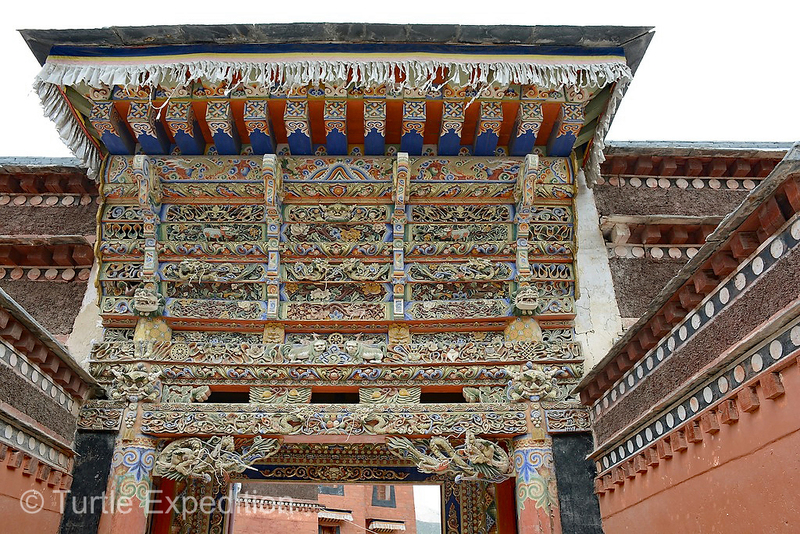 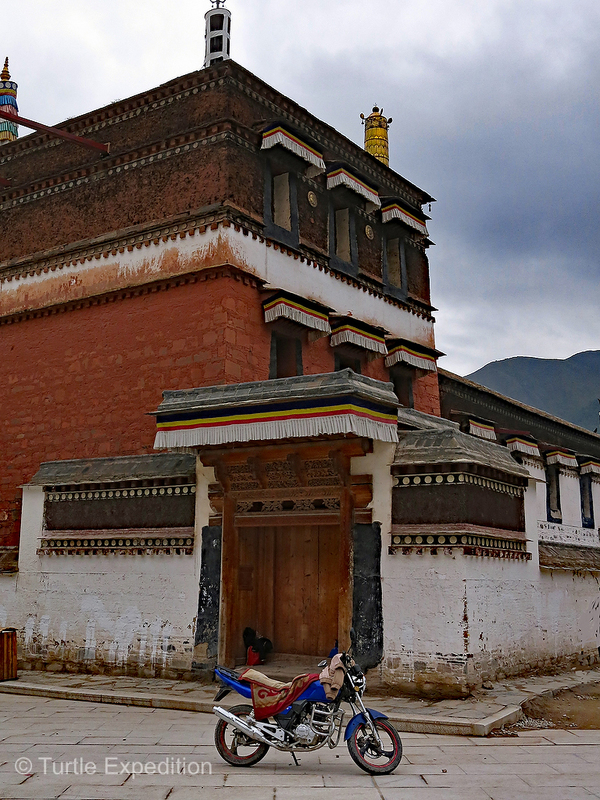 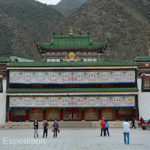 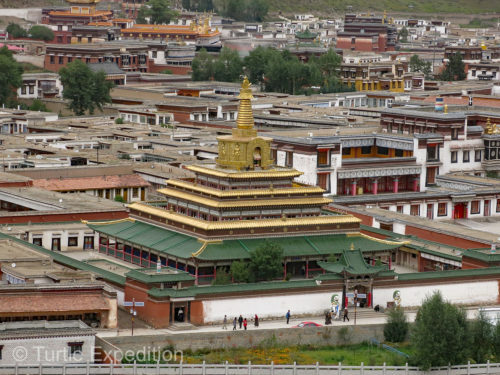 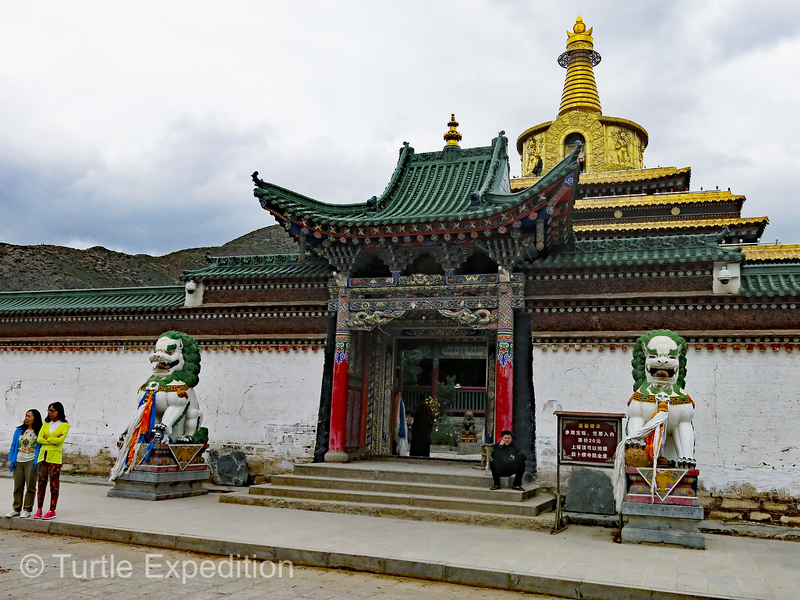 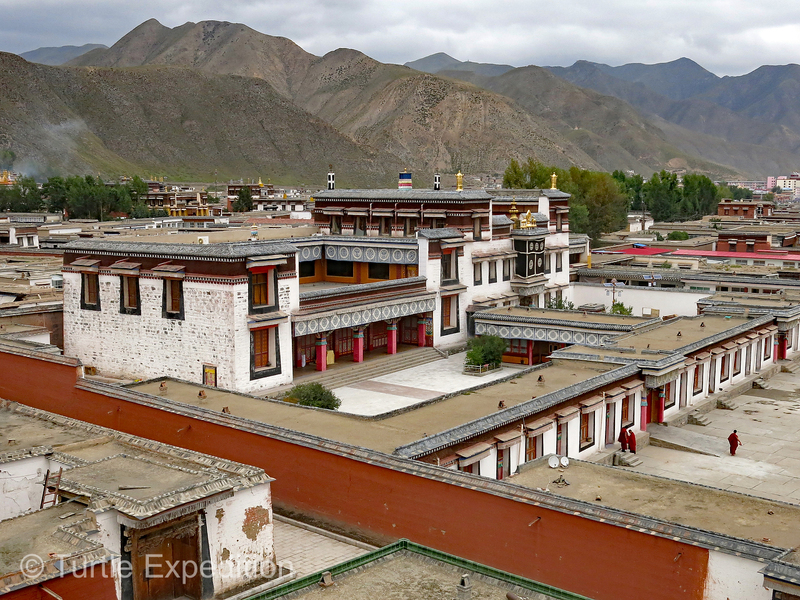 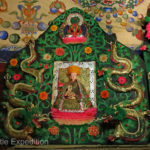 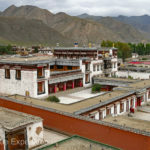 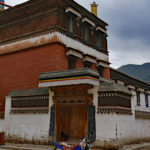 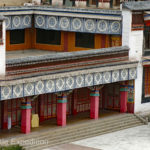 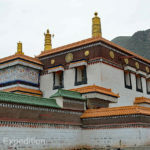 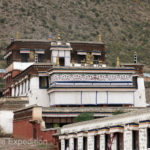 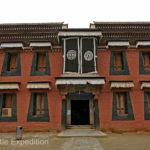 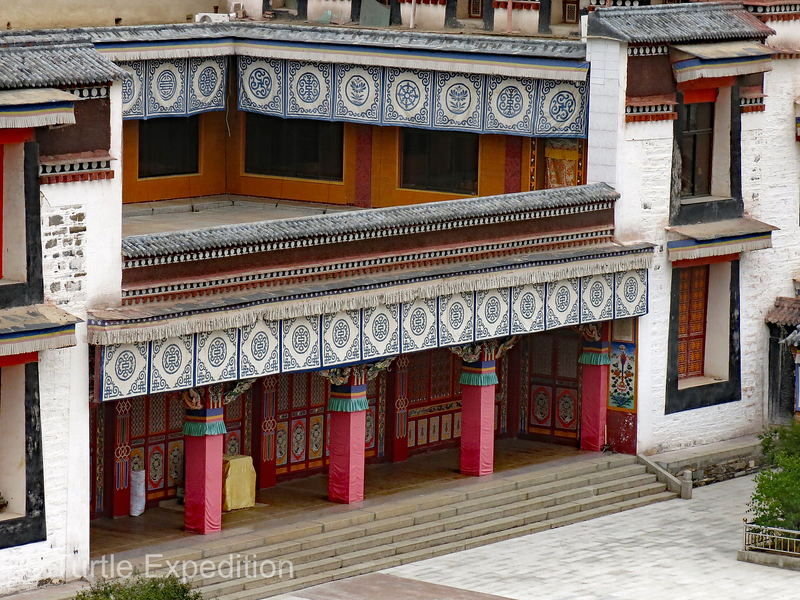 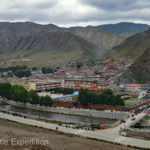 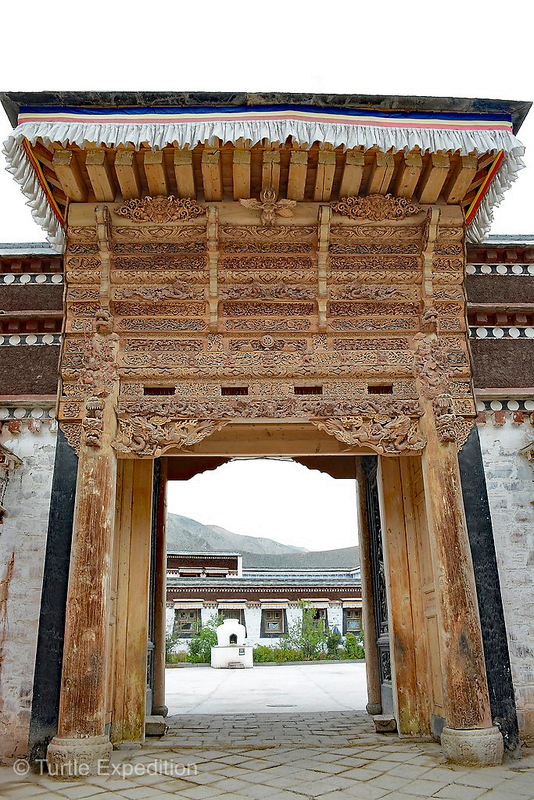 While founded in 1709 and expanded greatly in the following centuries, much of the Labrang monastery was destroyed during the Cultural Revolution but then rebuilt from the 1980’s onward. 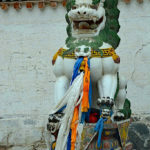 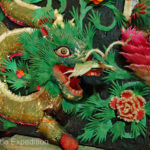 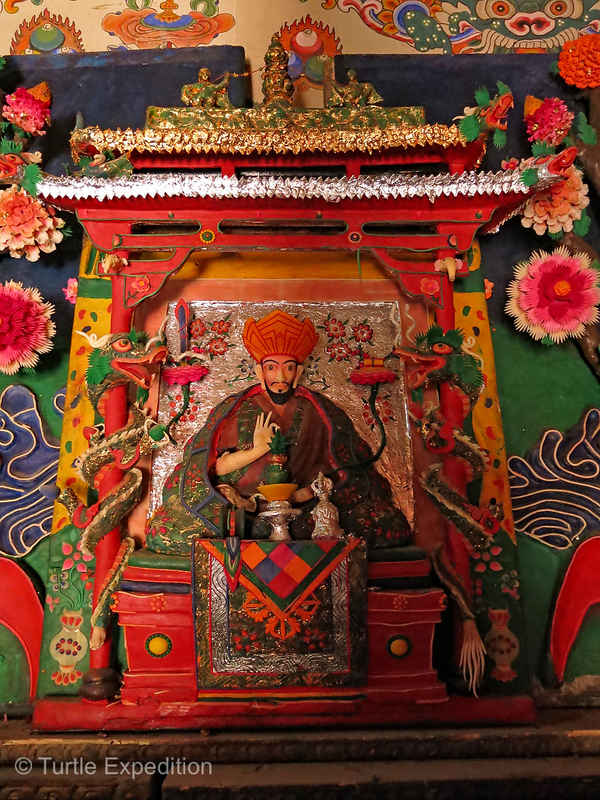 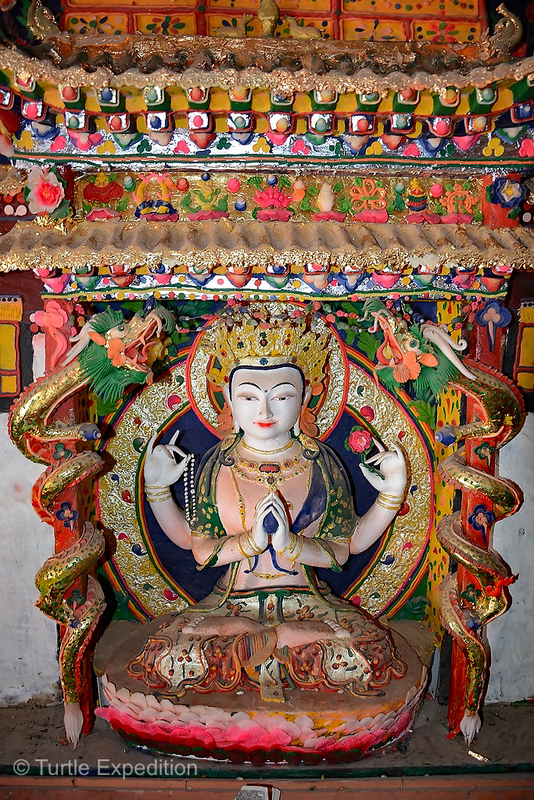 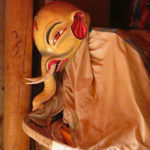 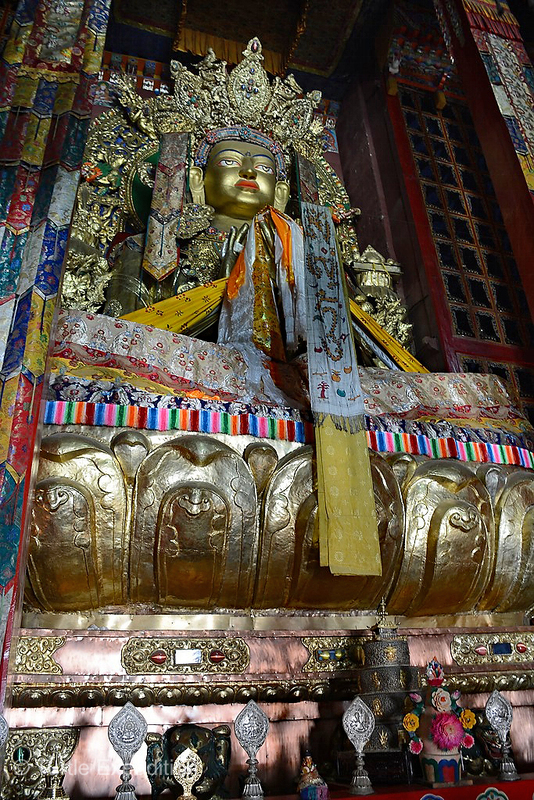 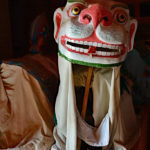 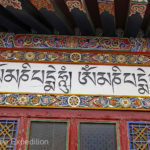 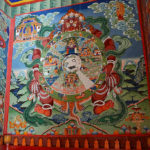 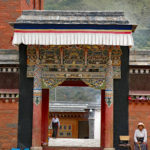 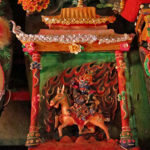 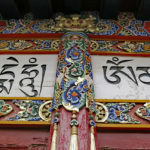 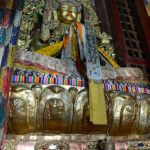 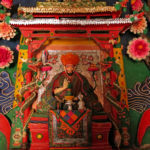 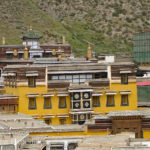 Founded in 1709, Labrang is one of Tibetan Buddhism’s most important monasteries outside the Tibetan Autonomous Region. 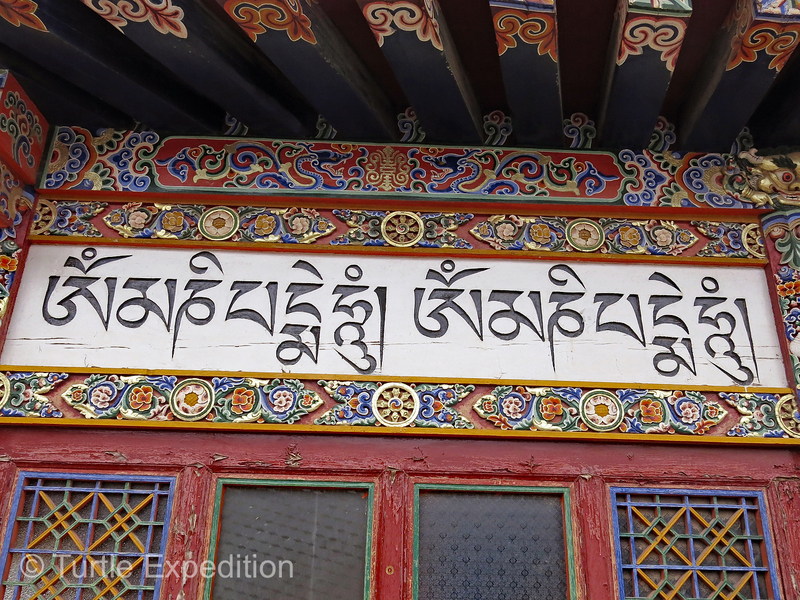 The formal name is Genden Shédrup Dargyé Trashi Gyésu khyilwé Ling or in Tibetan དགེ་ལྡན་བཤད་སྒྲུབ་དར་རྒྱས་བཀྲ་ཤིས་གྱས་སུ་འཁྱིལ་བའི་གླིང༌།. 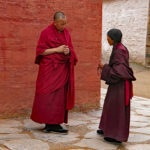 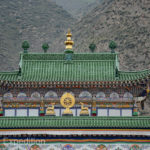 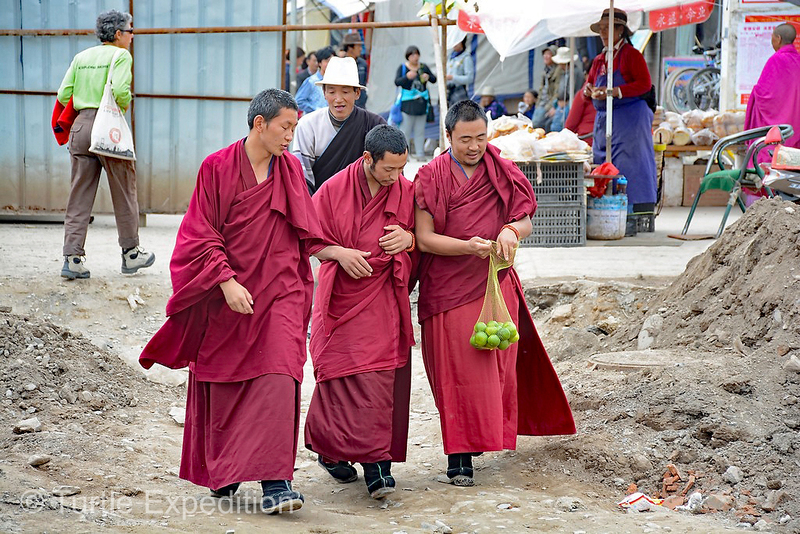 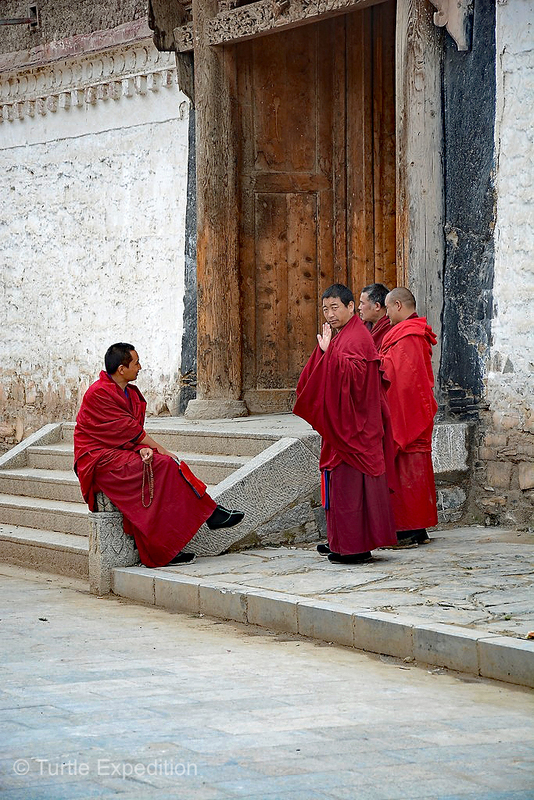 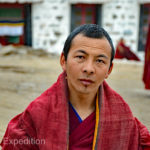 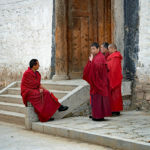 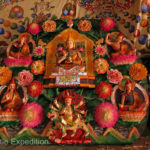 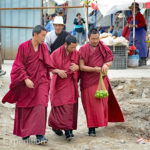 As a popular choice for many Tibetan monks to study at this influential Buddhist monastic university, the monastery has attracted monks from all over the Tibetan plateau. 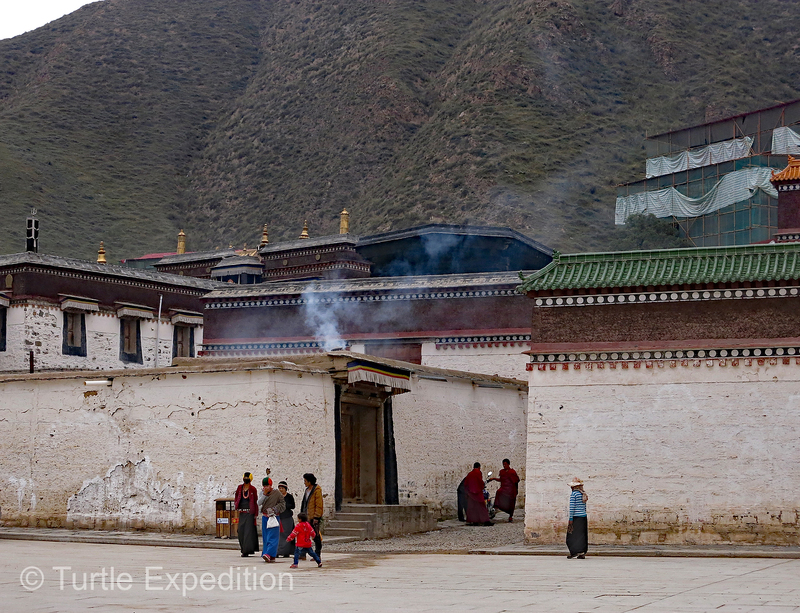 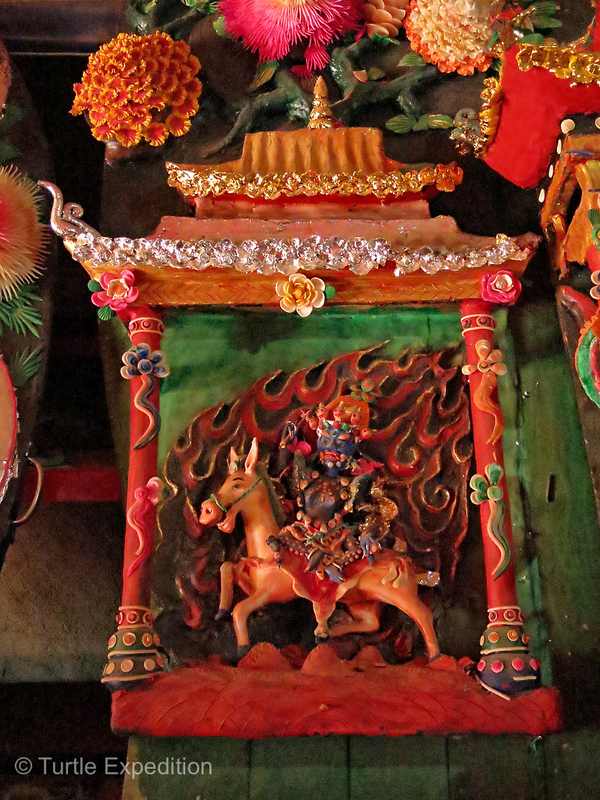 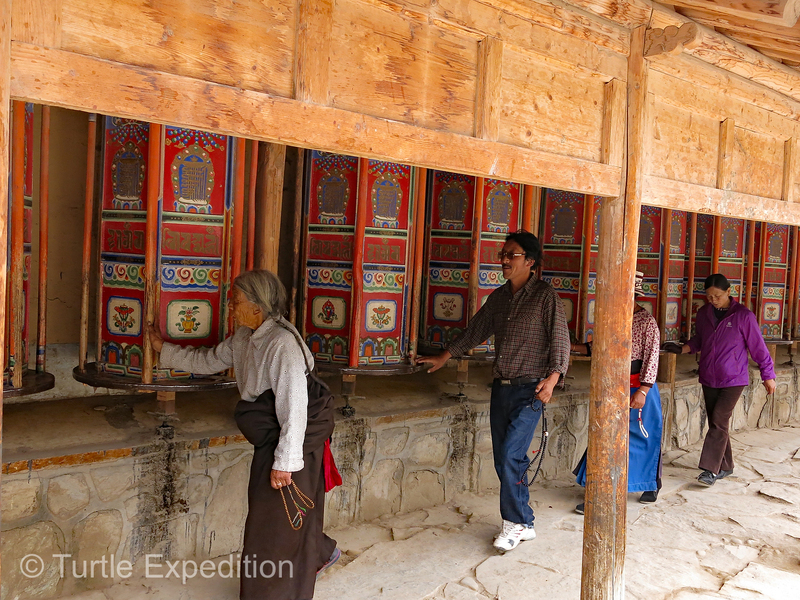 Labrang Monastery is also an important gathering place for many annual religious festivals. 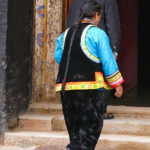 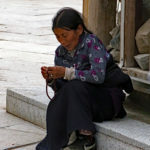 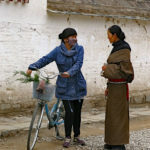 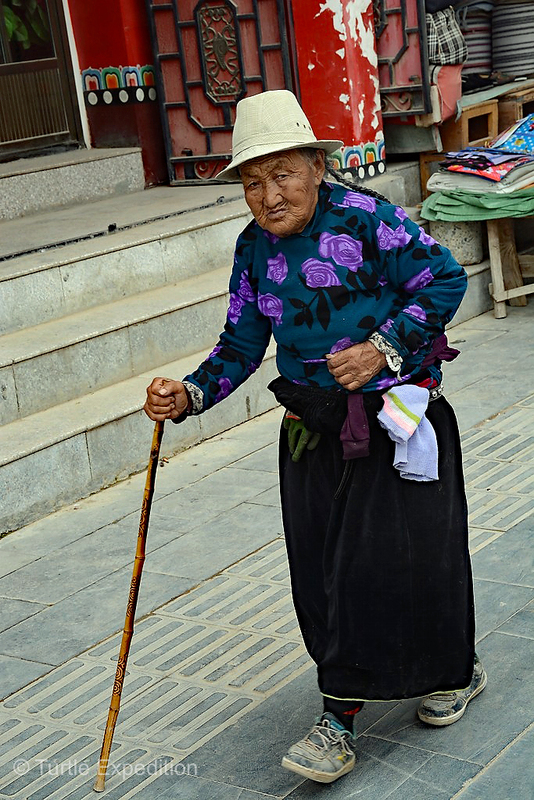 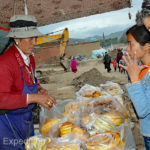 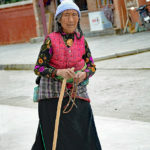 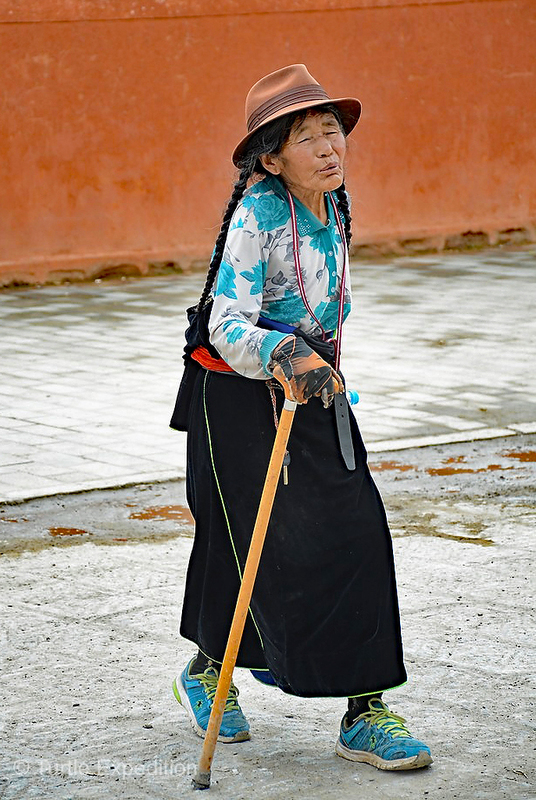 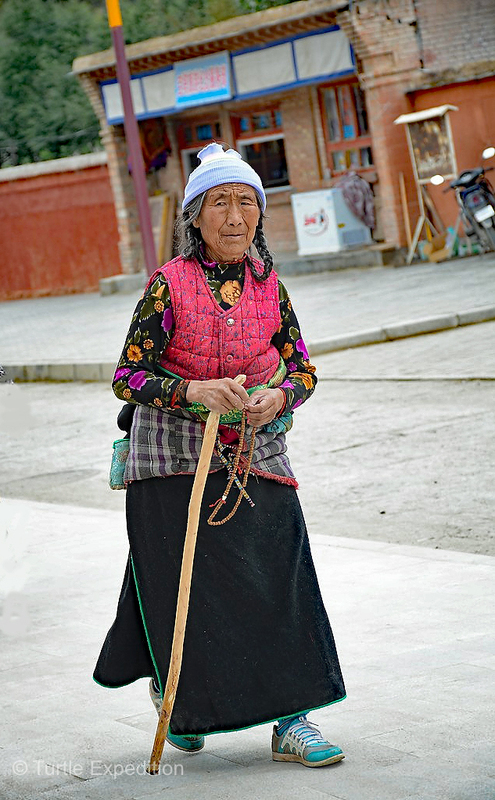 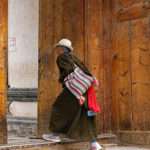 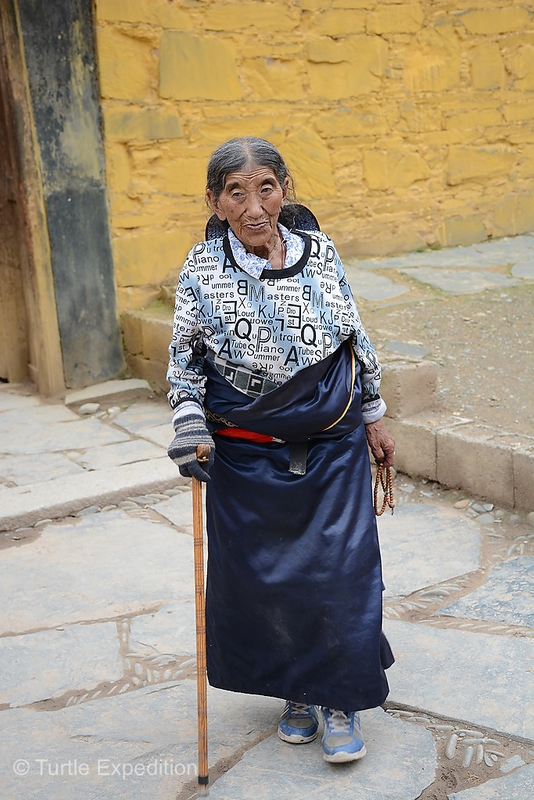 Believers on a pilgrimage visit in an effort for rewards in the next life (they believe in reincarnation) and to pray for their health, which could explain why we saw many older Tibetans walking with canes. 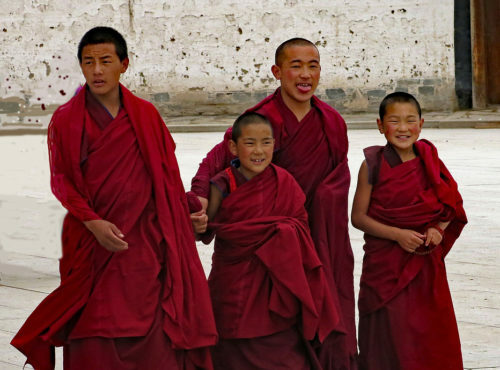 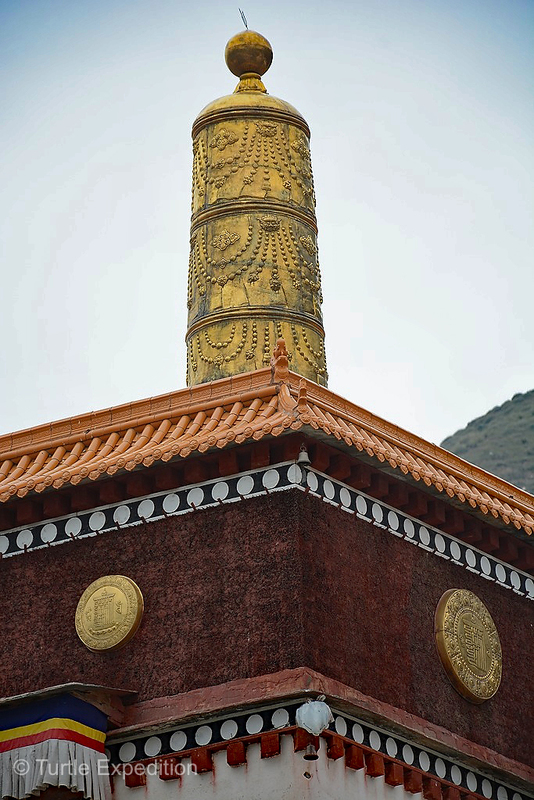 The Yellow Hat Sect of Tibetan Buddhism, also called the Gelug School, has its own history and background. 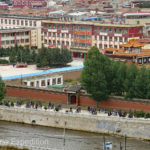 His Holiness, The Dalai Lama, belongs to this school. 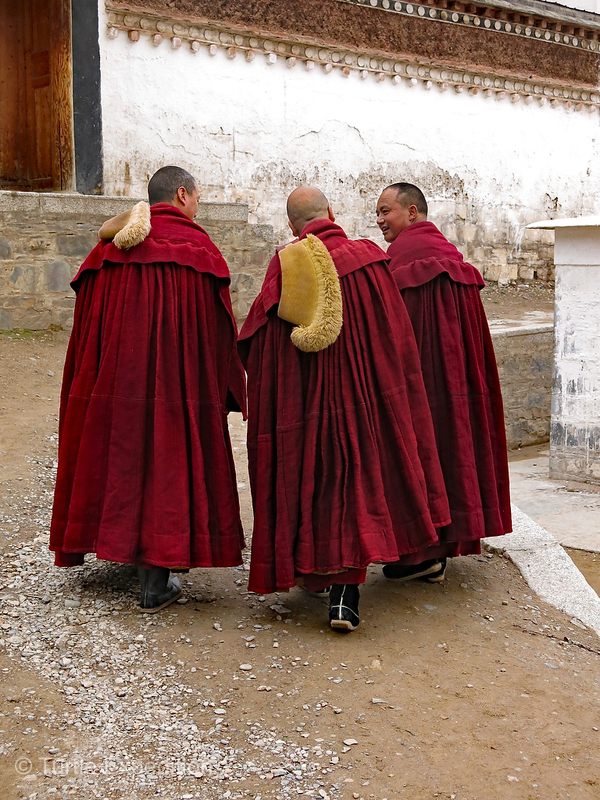 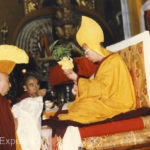 The yellow hats refer to the elaborate crescent-shaped hats worn by monks during ceremonies. 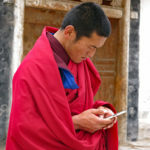 This monk definitely knew about modern technology. 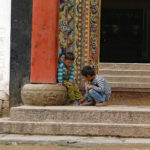 Children enter the monastery at a very young age. 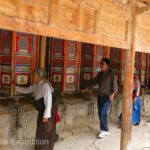 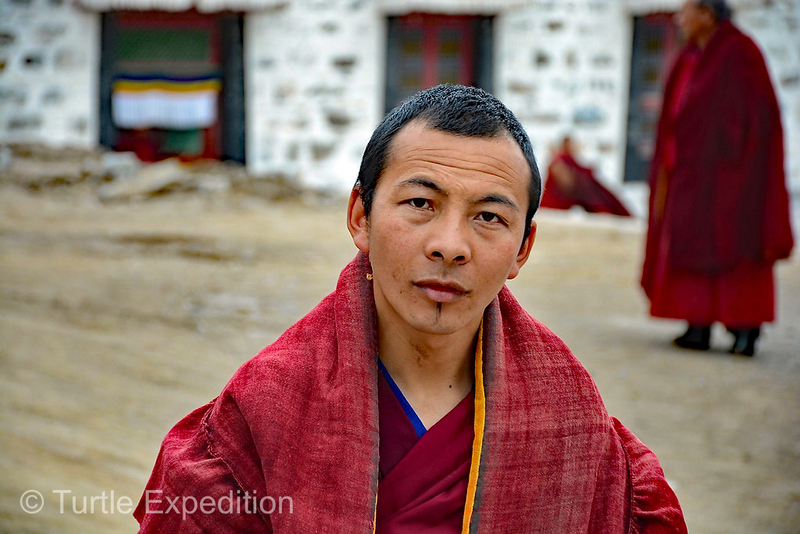 Our guide, Green, had studied Tibetan Buddhism and was a wealth of information, but for us, it is an extremely complicated religion. 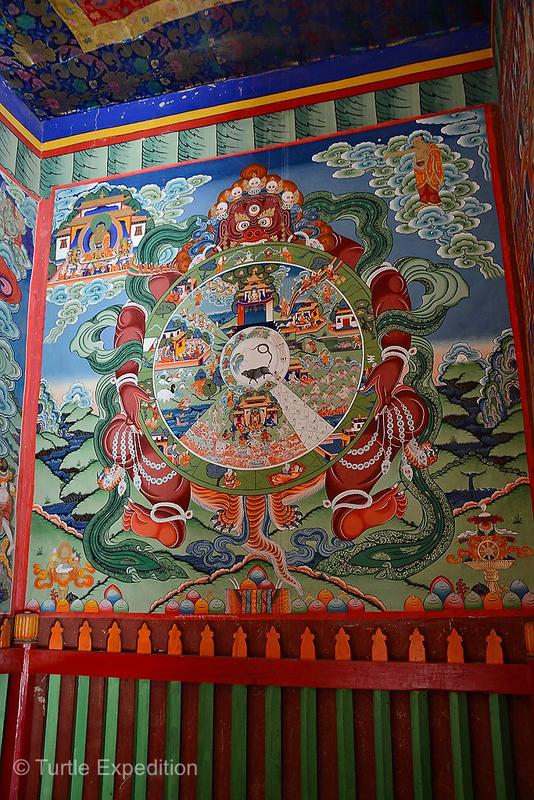 I could imagine it would seem equally baffling if a Tibetan Buddhist visited the Vatican in Rome. 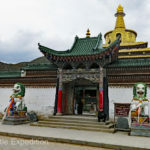 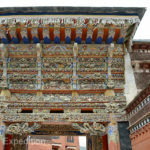 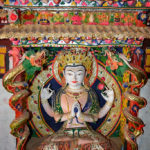 We could only appreciate the architecture and the general feeling of the Monastery, with its beautifully carved entrances, pagodas, temples and the amazing art work inside the temples. 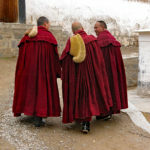 In a way, we felt we were actually in Tibet. 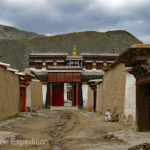 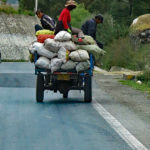 While we would have liked to linger longer in this peaceful town, being on a strict timetable, we soon had to continue towards our next destination. 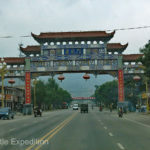 We headed toward the Bin County Cave Temple. 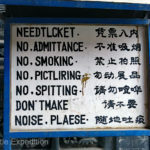 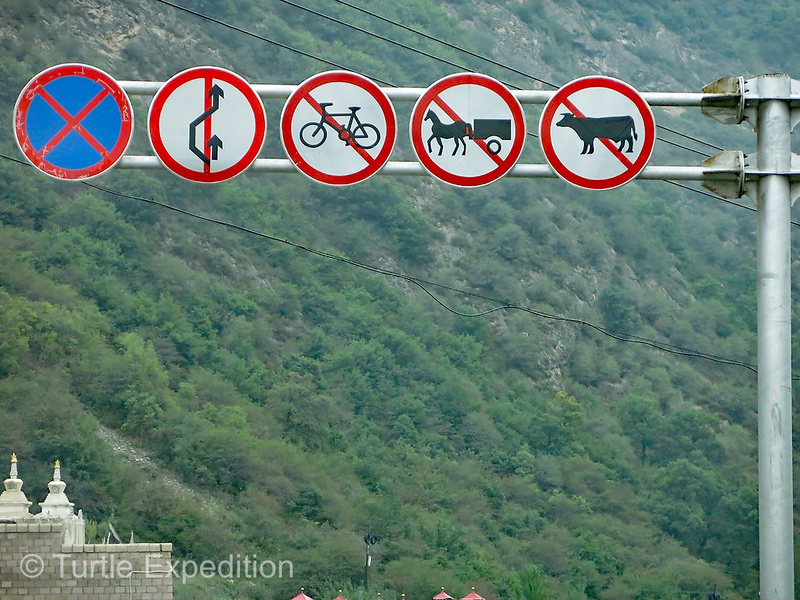 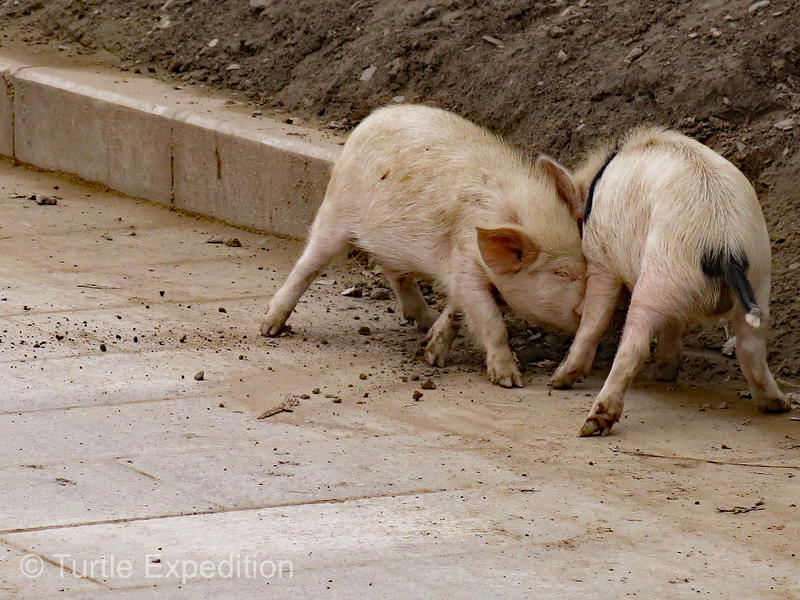 It was not on our “Must see in China” list, but Green insisted we had stop there. 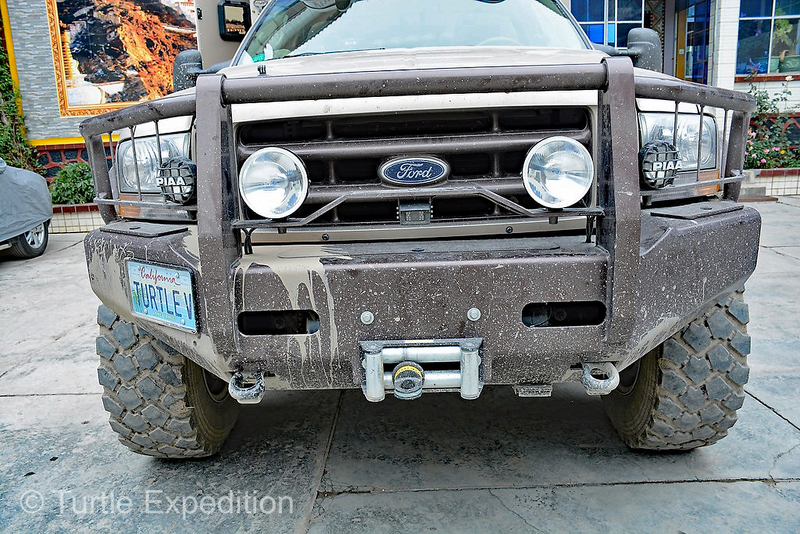 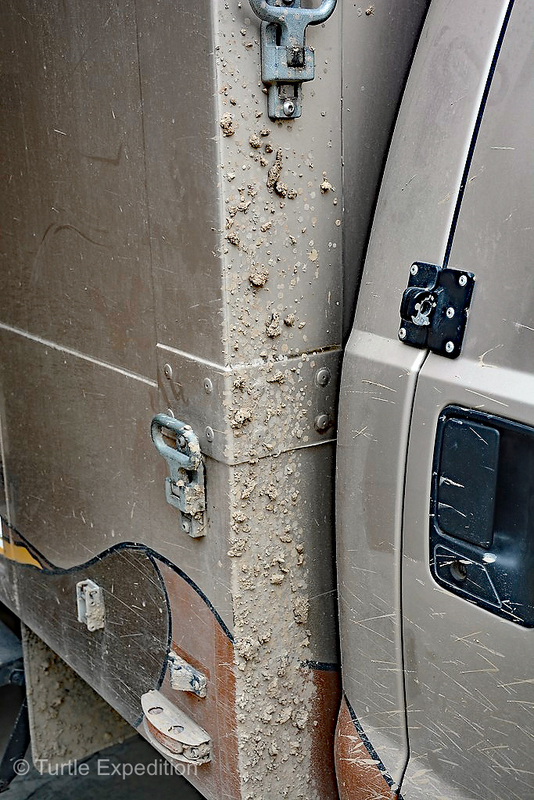 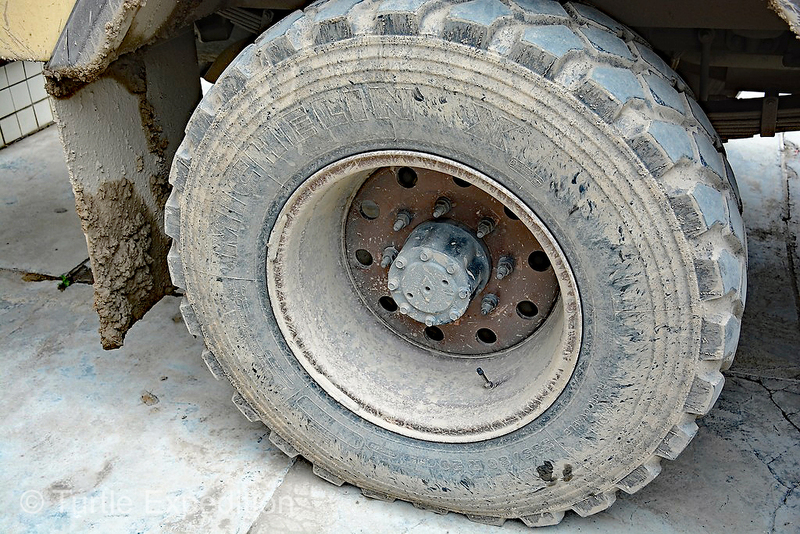 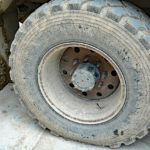 The Turtle V was looking a little road weary. 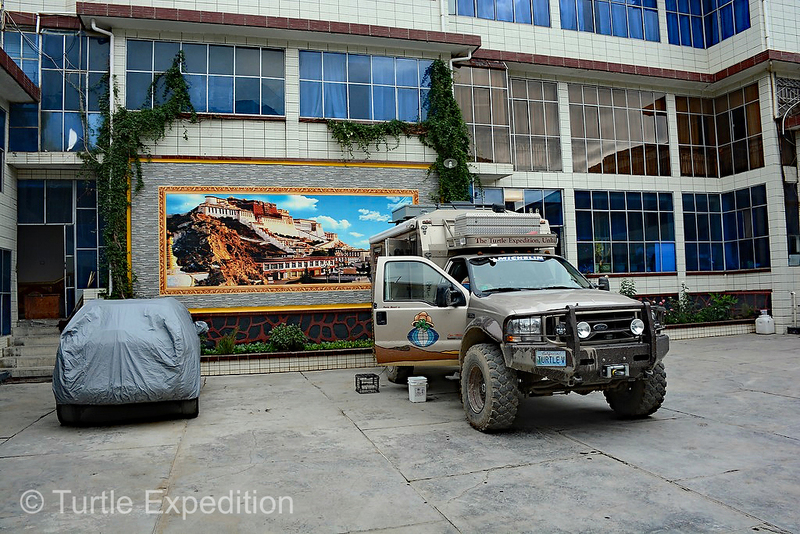 The quiet courtyard of the Tara Guesthouse was an ideal place for Overlanders to spend the night. 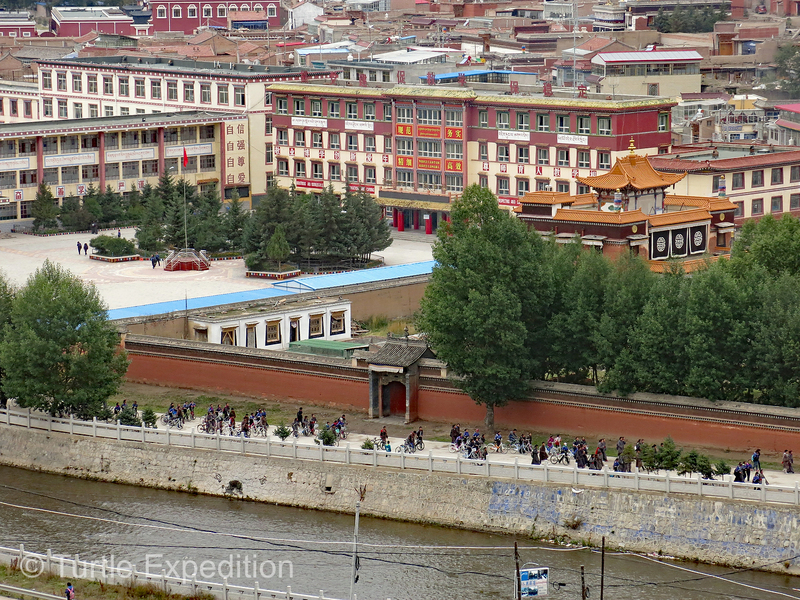 From a hilltop we could appreciate the size of the monastery complex. 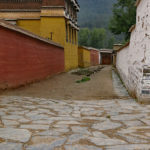 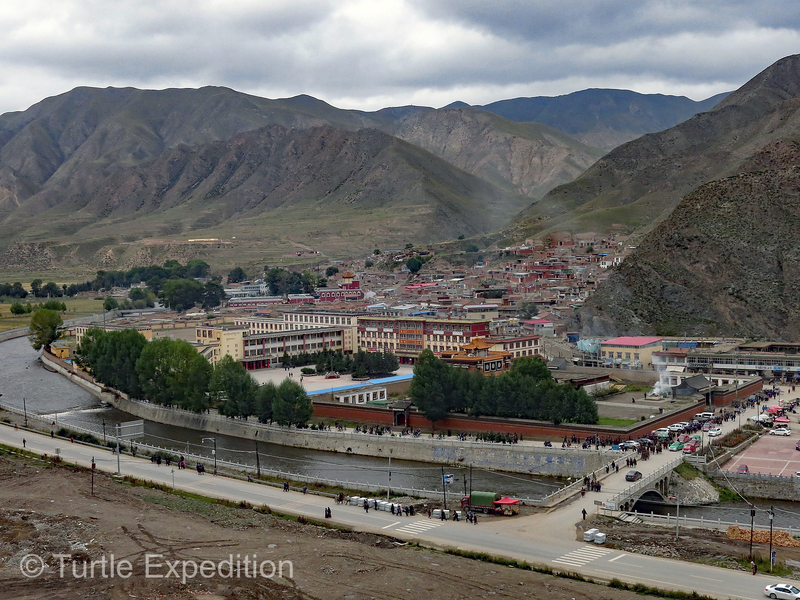 This was the central part of the large Labrang monastery “city”. 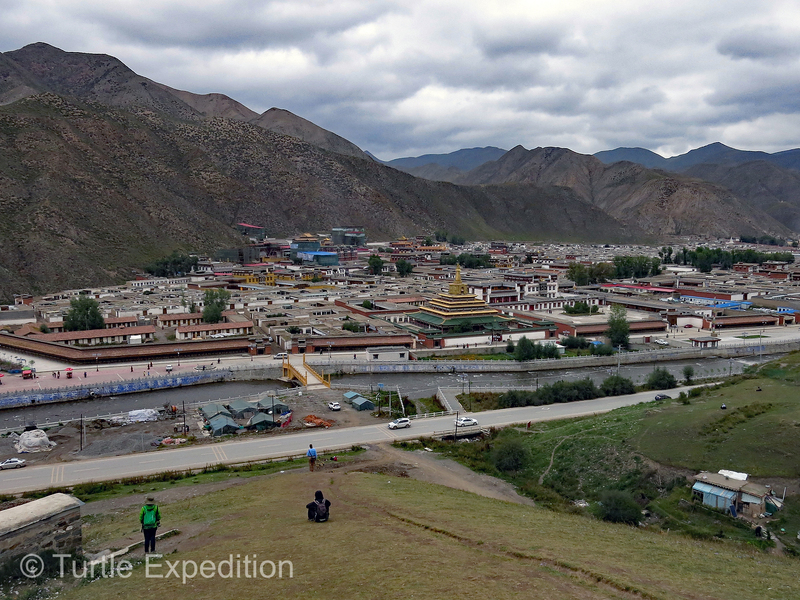 Looking down from our vantage point, the monastic university complex was to our left. 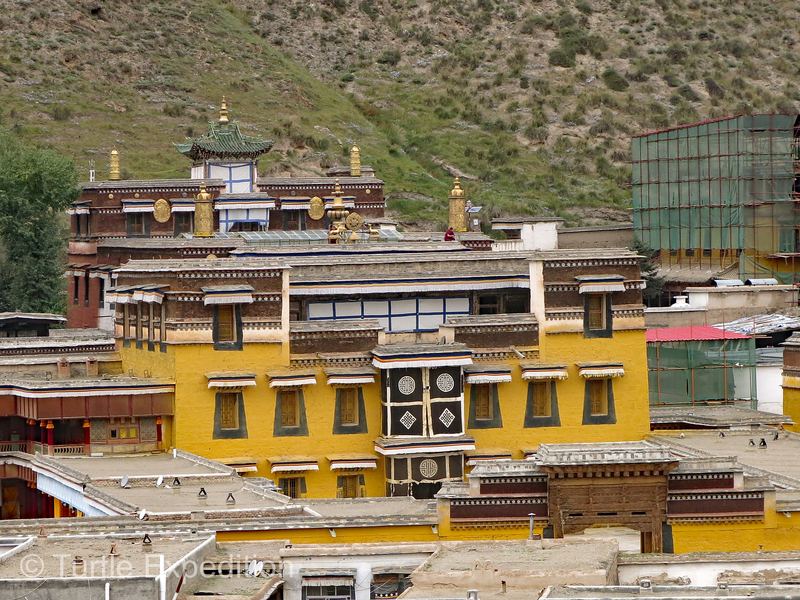 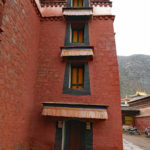 A close-up of the Labrang monastic university. 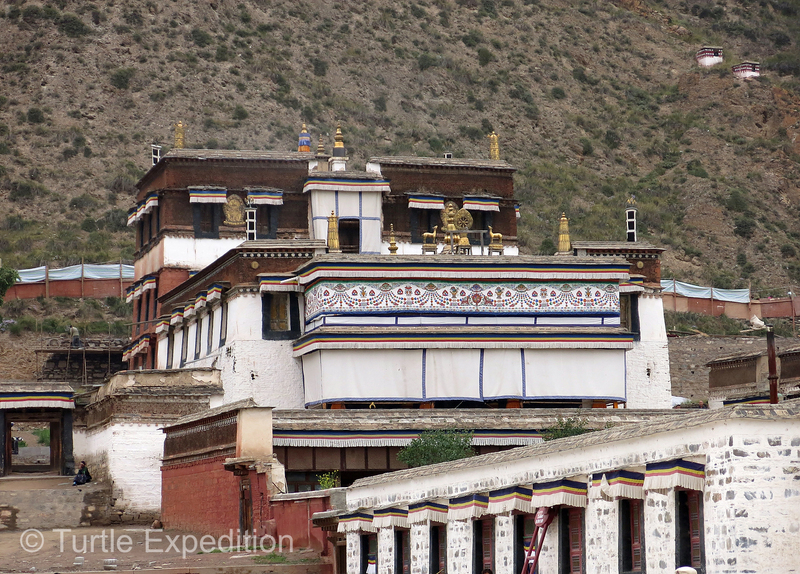 This is of the main Labrang Monastery temples. 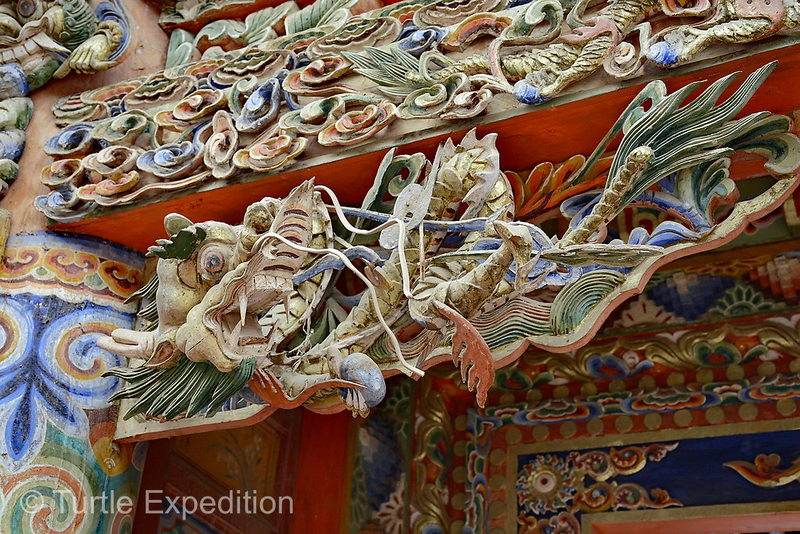 The details on this temple were beautiful. 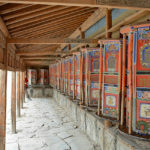 The architecture of Tibetan Buddhist temples, pagodas and houses was very unique. 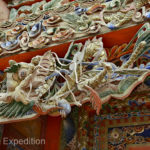 Strolling around the streets and alleys, the colors were fascinating and unique to China. 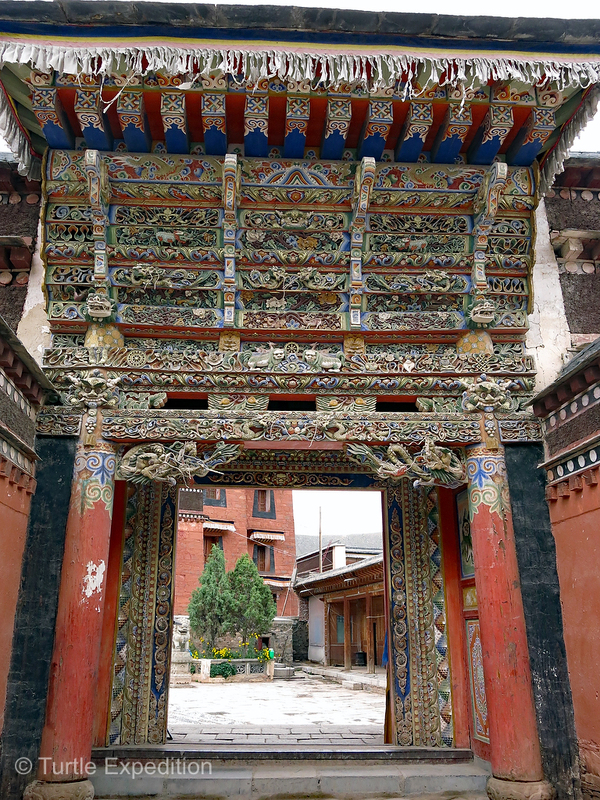 The architecture and attention to detail on these entrance gates were beautiful. 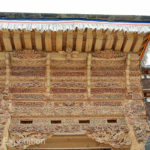 Volunteer masters must have carved this entrance gate. 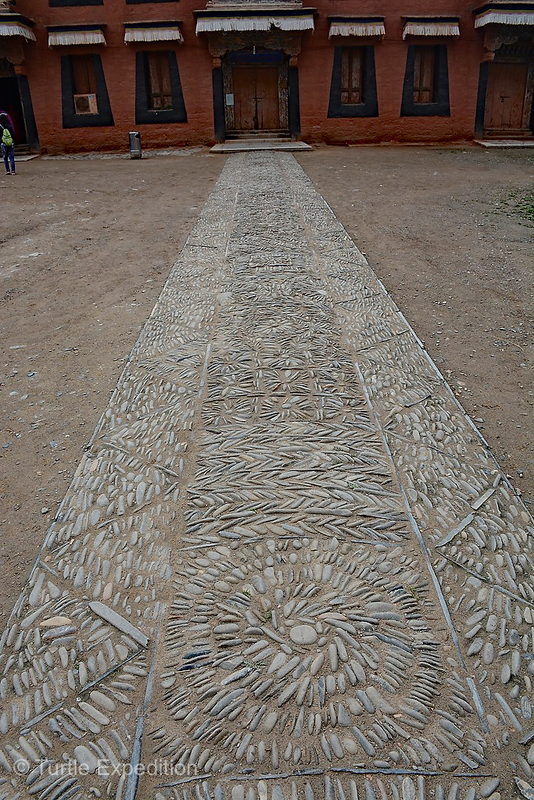 How many people have walked up this entrance pathway? 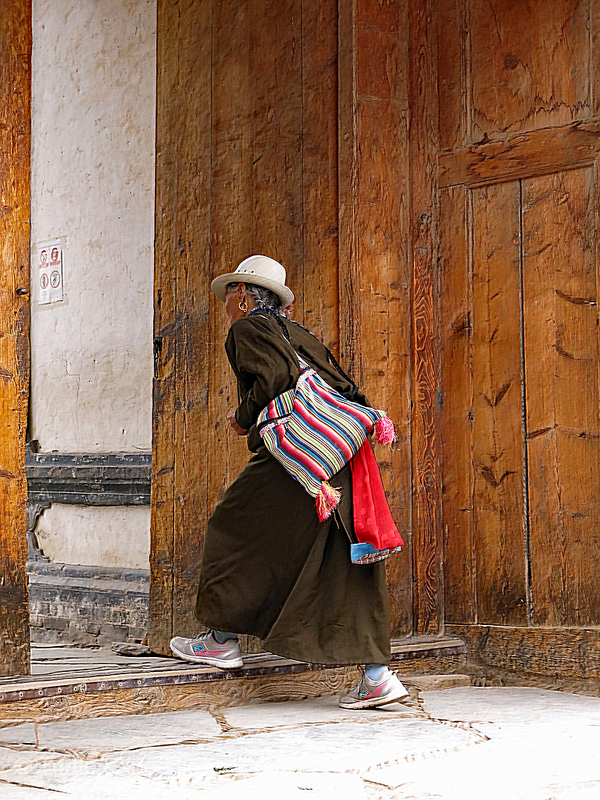 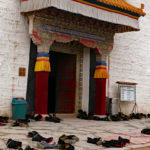 Tibetan Pilgrims often prostrate themselves on their way to the main temple. 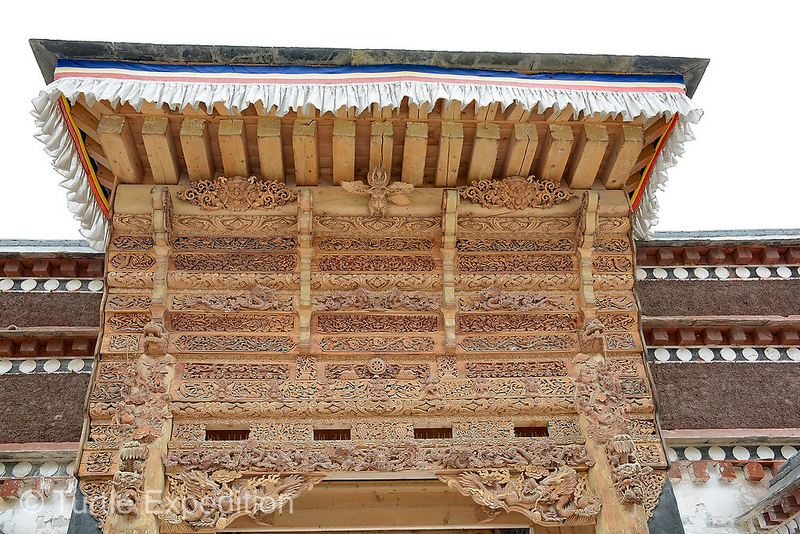 There were at least three intricately carved entrance gates. 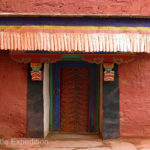 This entrance was particularly amazing with all its complicated symbolism that only a master Tibetan Buddhist could interpret. 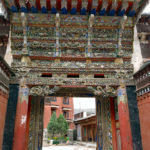 Details of an entrance gate. 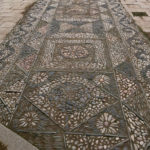 Some of the beautiful inlay walkways were all created by volunteers. 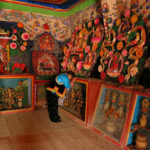 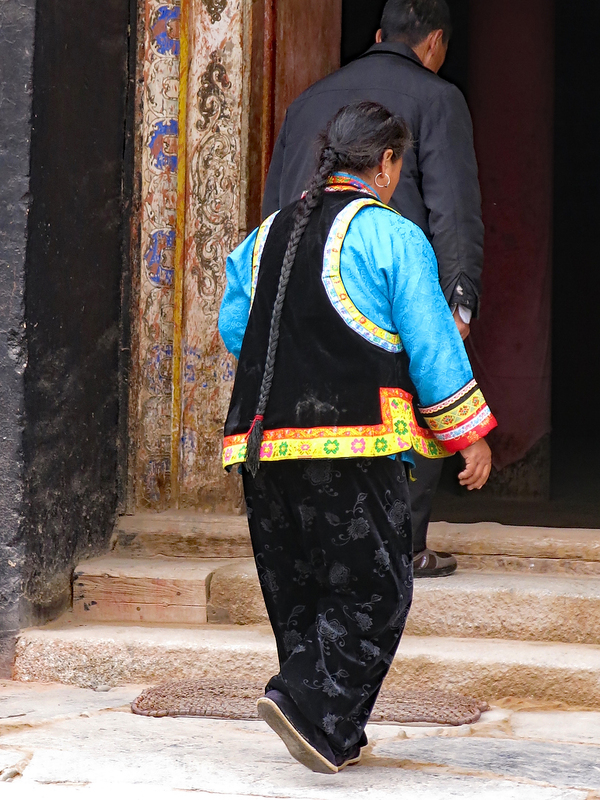 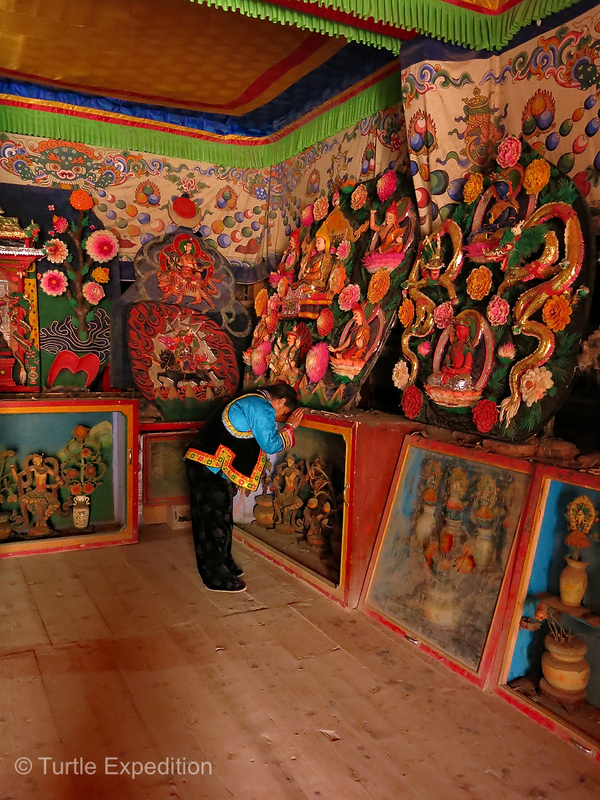 A Tibetan worshipper enters the sanctuary filled with yak butter monuments. 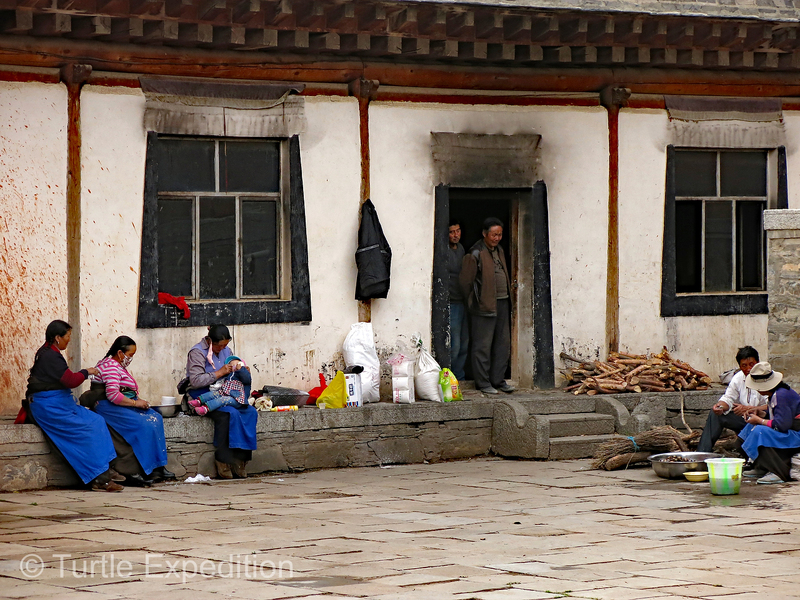 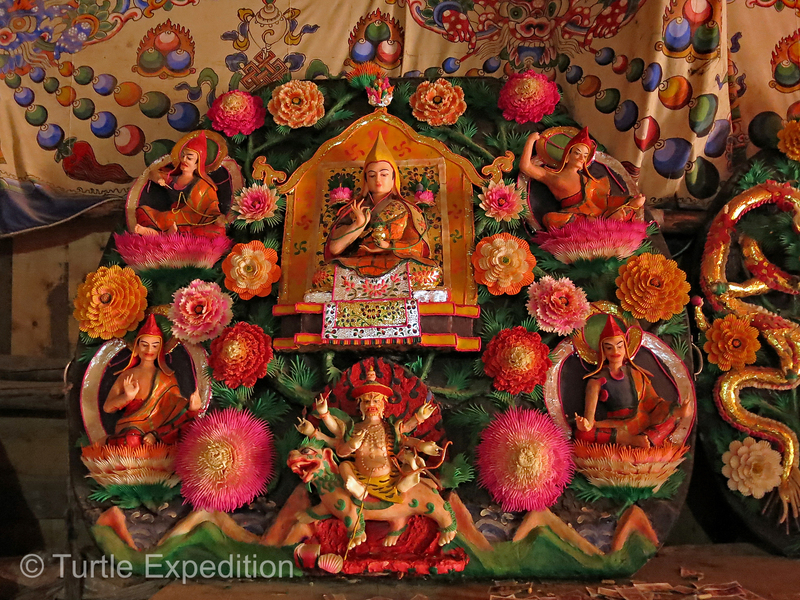 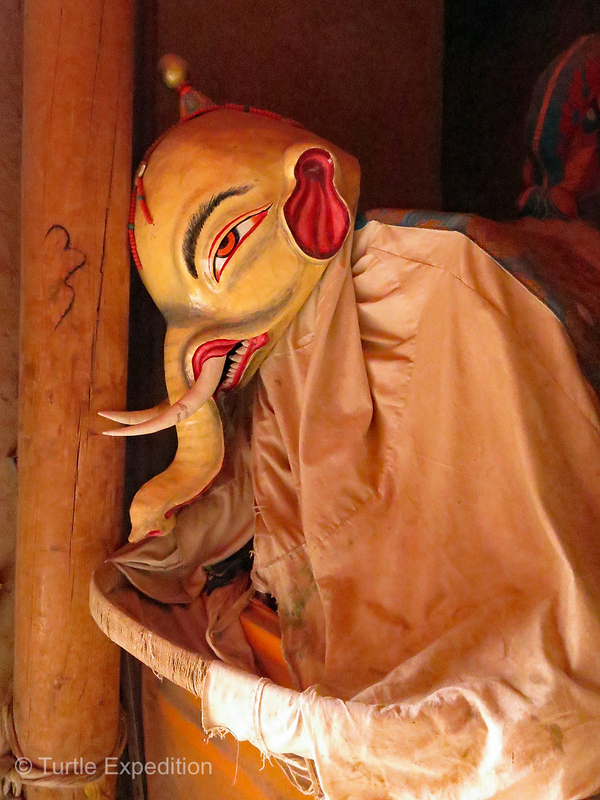 These yak butter creations stayed in this cold room for one year. 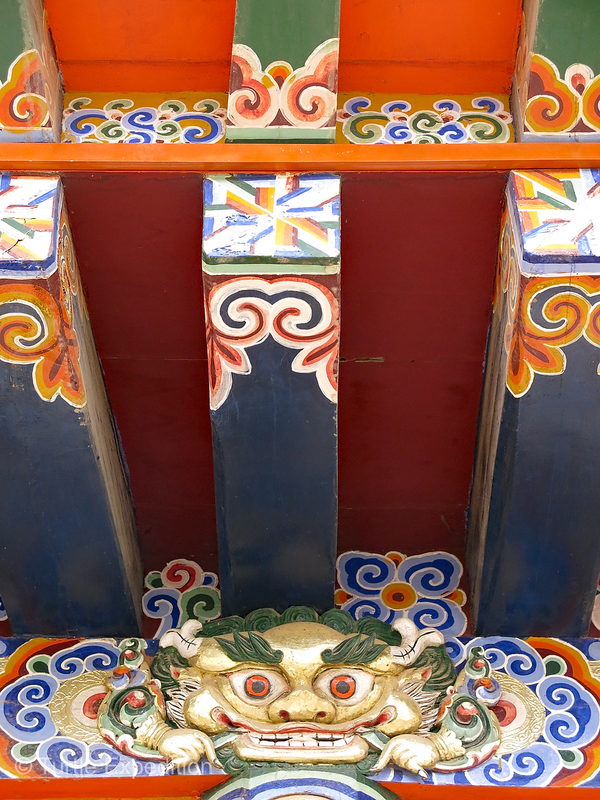 Details of many of the yak butter tablets were exquisite. 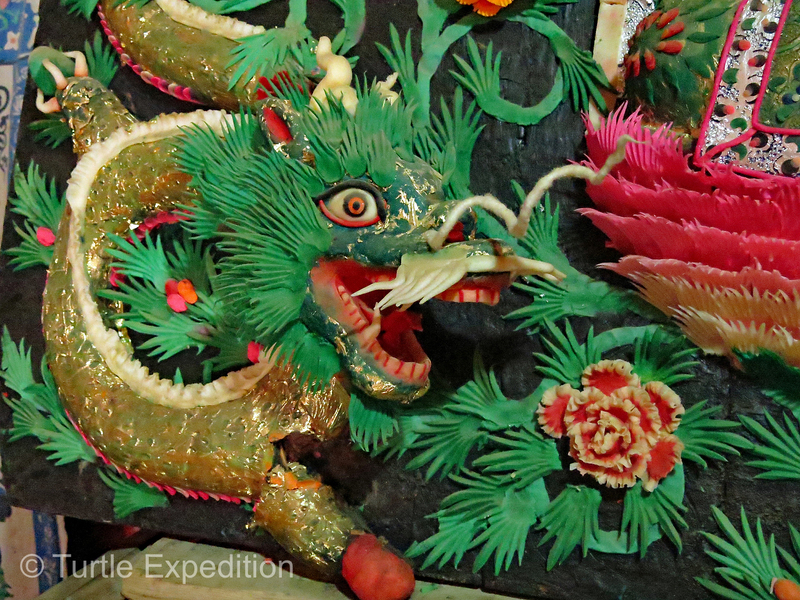 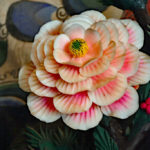 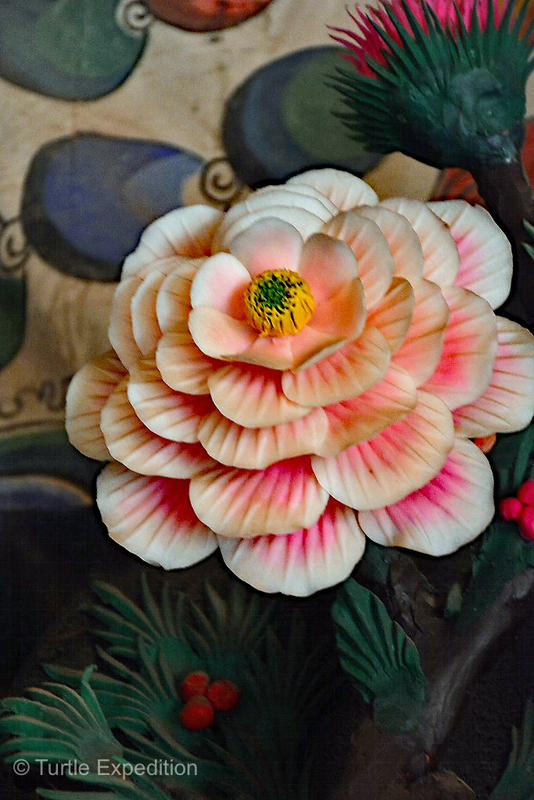 These intricate flowers were carved from yak butter for a specific festival. 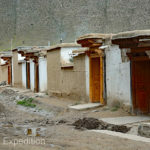 Yes, the room was cold. 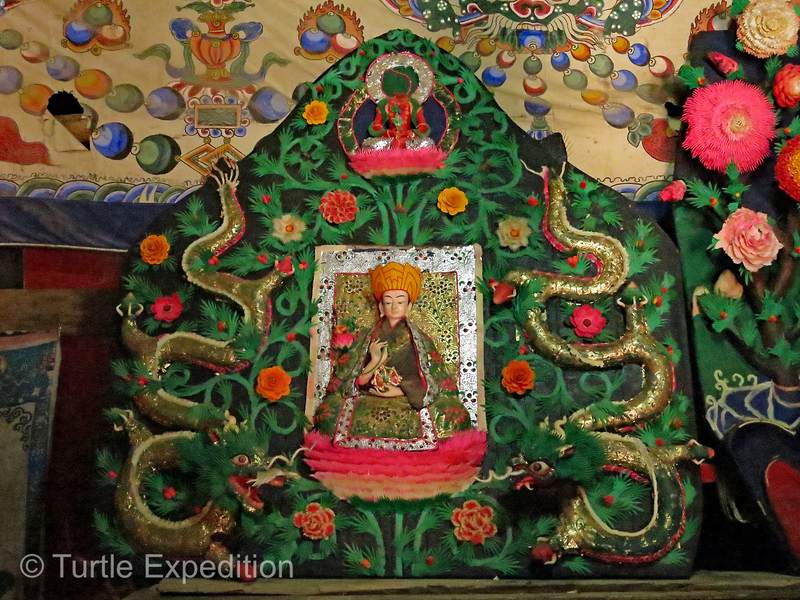 Dragons seemed important figures. 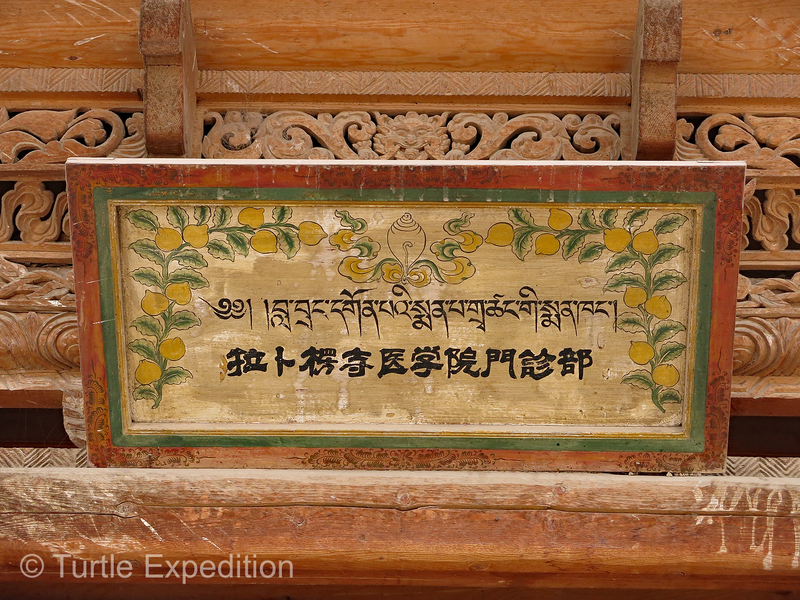 This one is a yak butter creation. 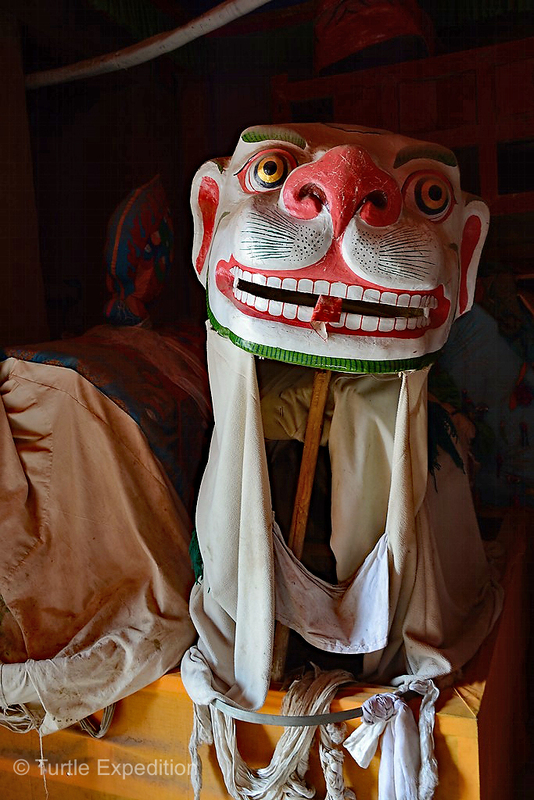 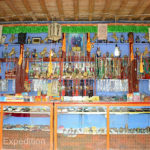 Wooden dancing figures used during processions were stored in a corner. 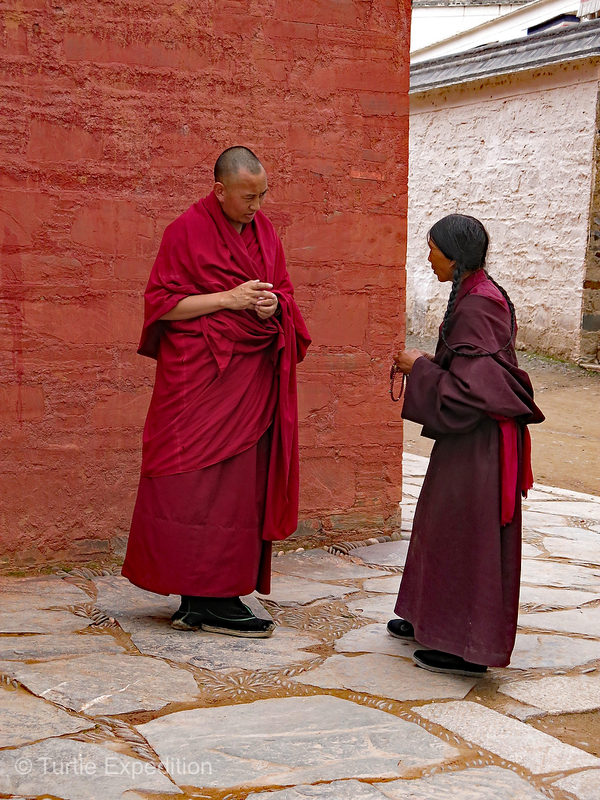 Monks do not have to work. 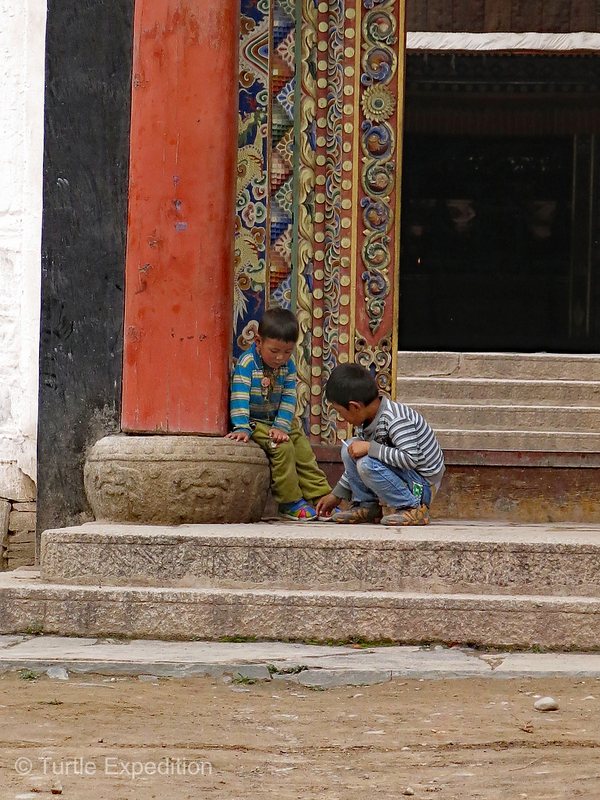 Their life is supposed to be all about prayer. 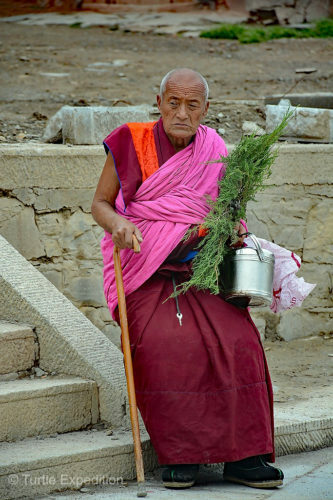 No attachment to physical material things. 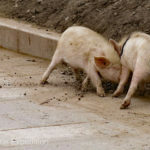 They live off donations. 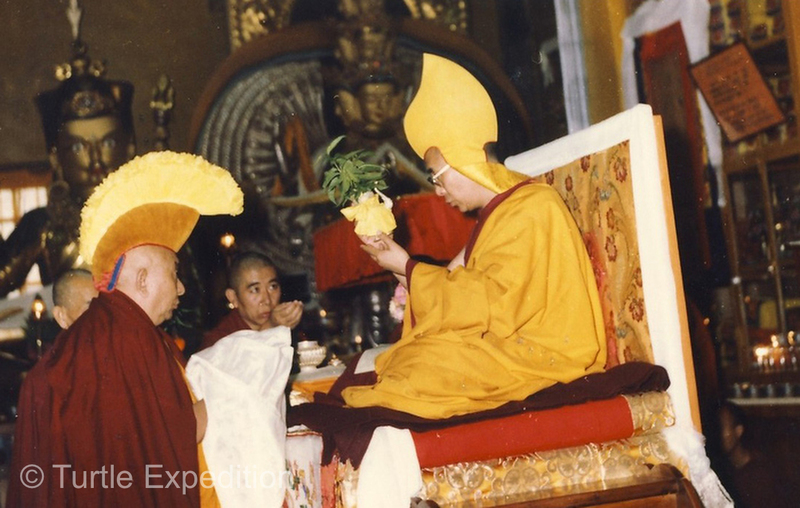 This hat wearing monk must have been of high rank. 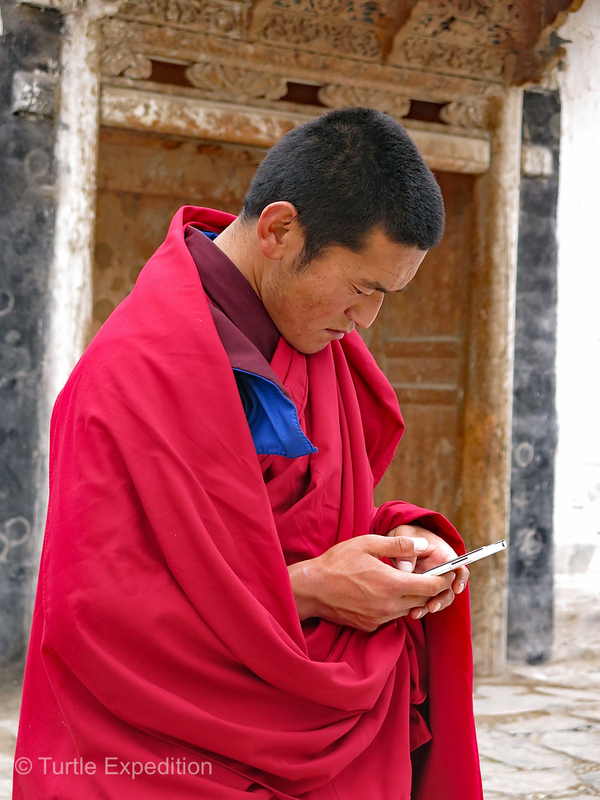 Oh yes, cell phones are very popular among monks of all ages. Not sure where the “giving up wordly”possessions figures into this arena. 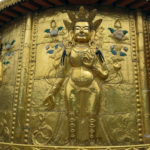 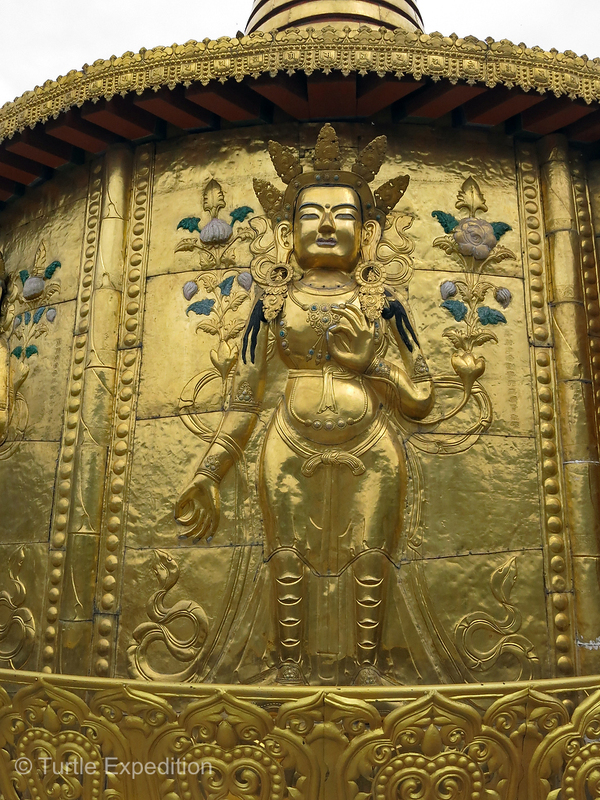 This magnificent Buddha in one of the main temples was sheathed in gold leaf. 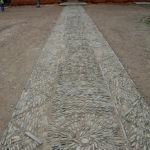 Nothing was “just art”. 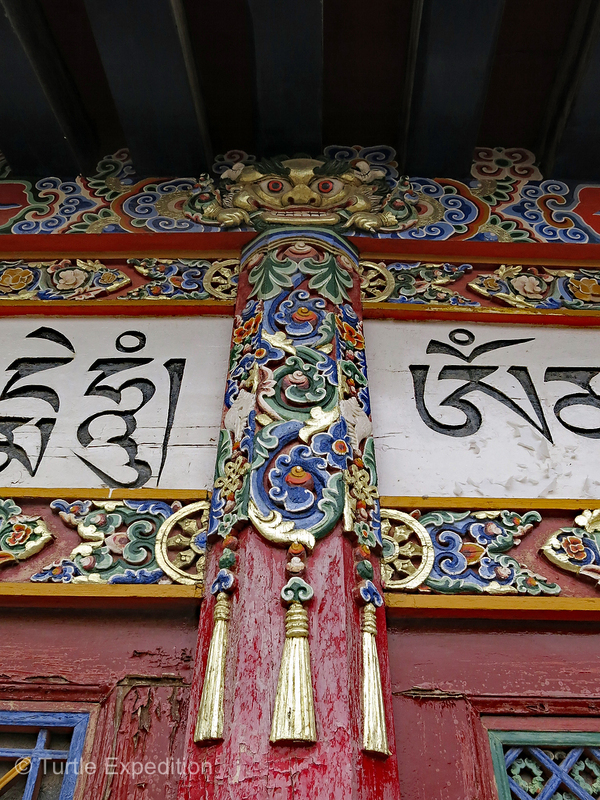 Everything was full of special meanings in the Tibetan Buddhism religion. 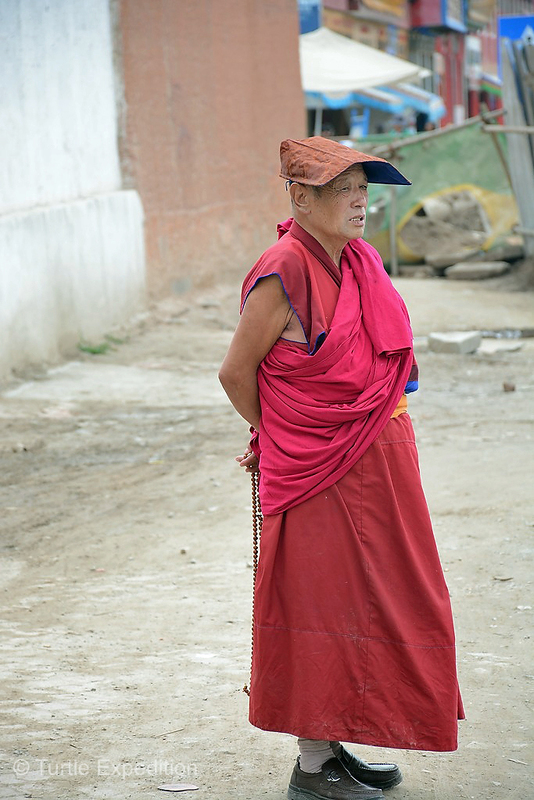 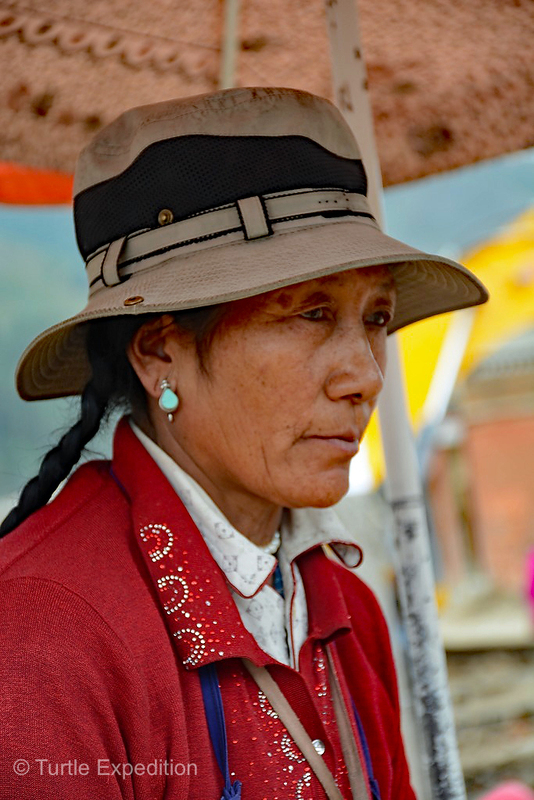 The Yellow Hat Sect of Tibetan Buddhism refers to the elaborate crescent-shaped hats worn by monks during ceremonies. 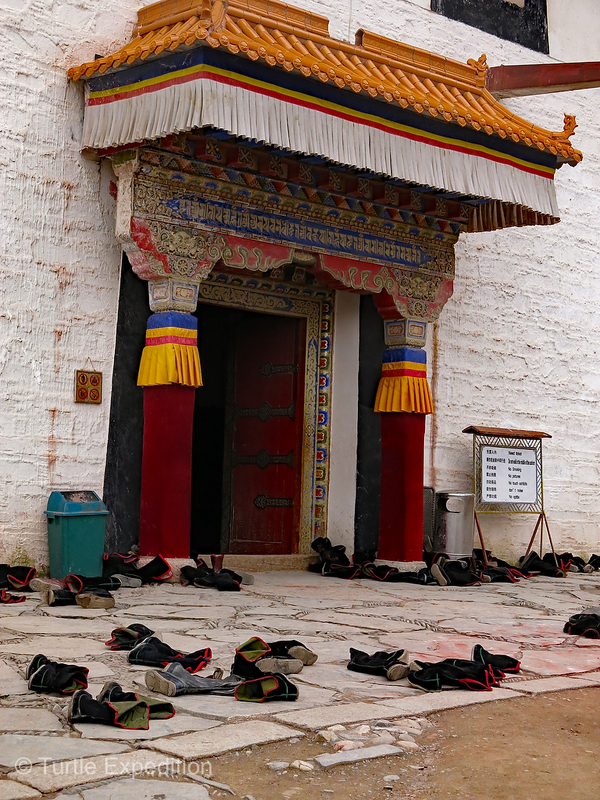 Monks gathered for prayer in one of the main temples leaving their shoes outside. 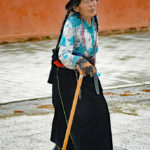 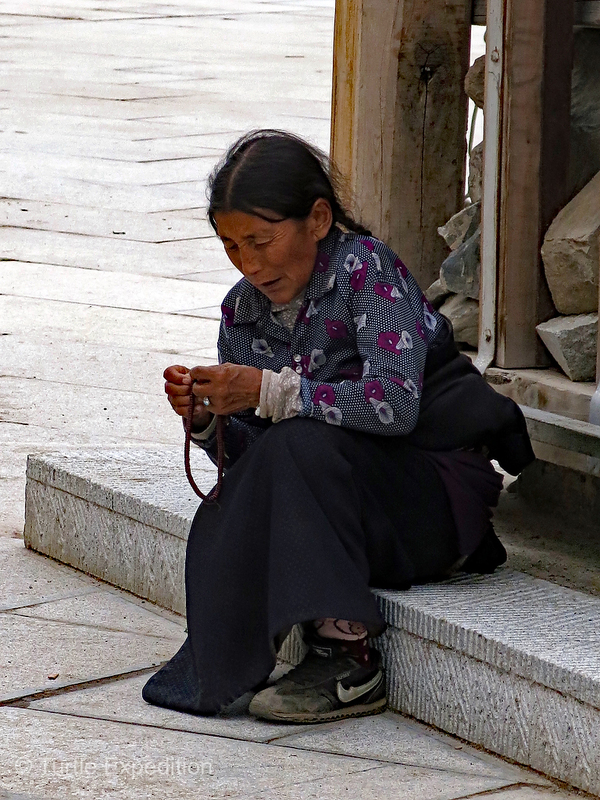 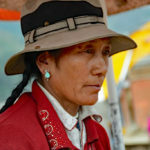 Tibetan Buddhist Pilgrims: We had never seen so many people with canes and brand new tennis shoes. 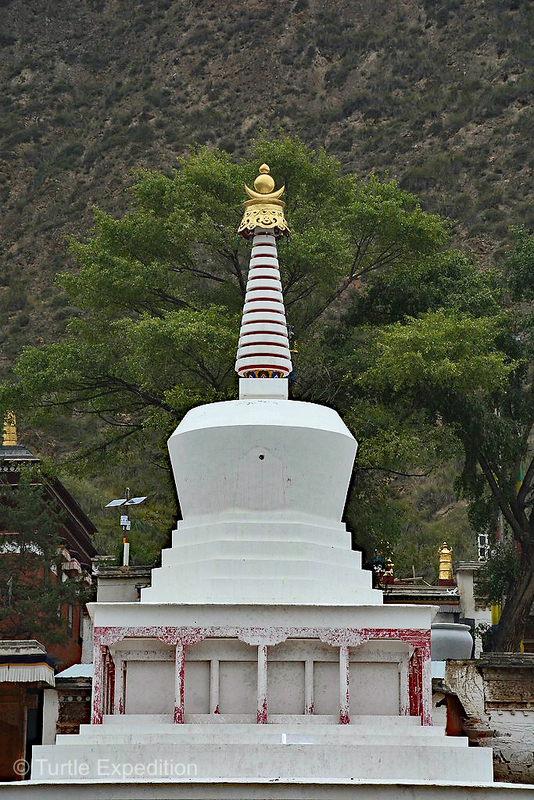 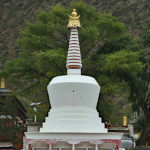 This towering white stupa had special meaning. 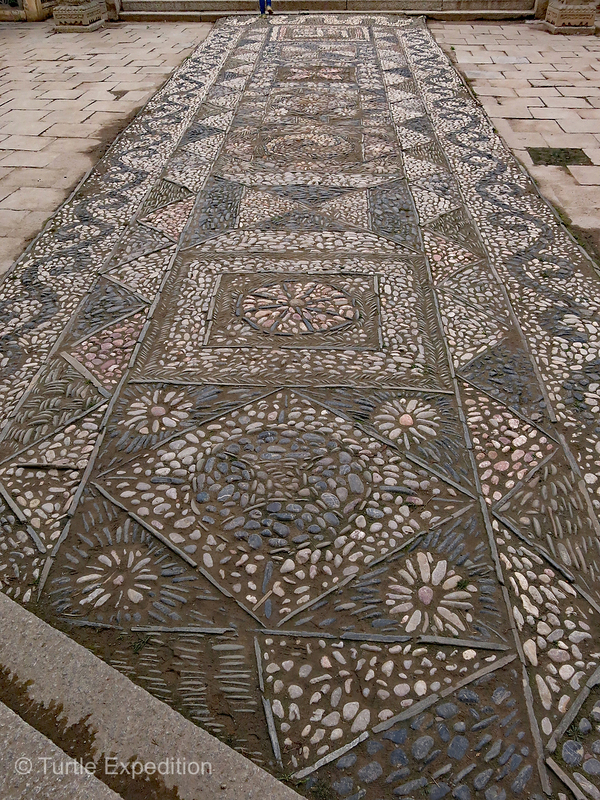 Pilgrims were walking around it in prayer. 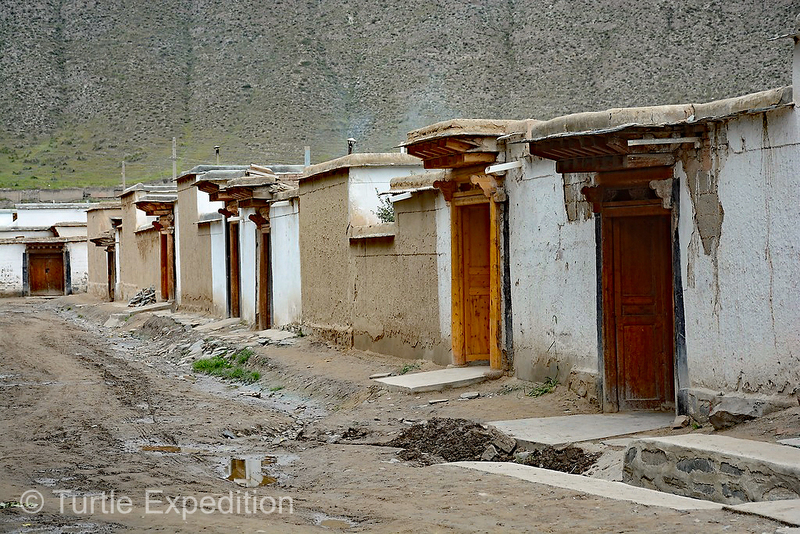 Accommodations for monks were quite spartan. 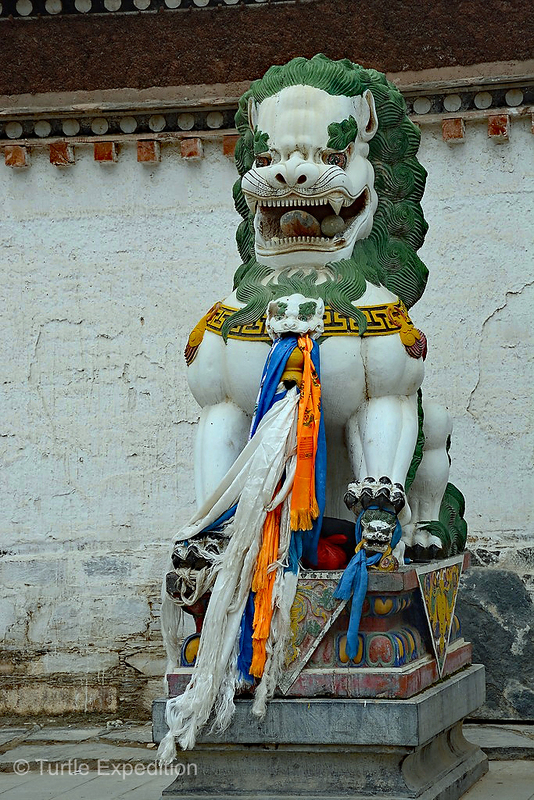 This royal lion guards the entrance of this golden pagoda. 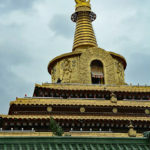 Green and Monika trekked up to the top of this golden pagoda. 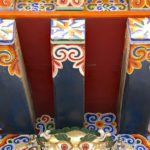 A detail from the top of the golden pagoda. 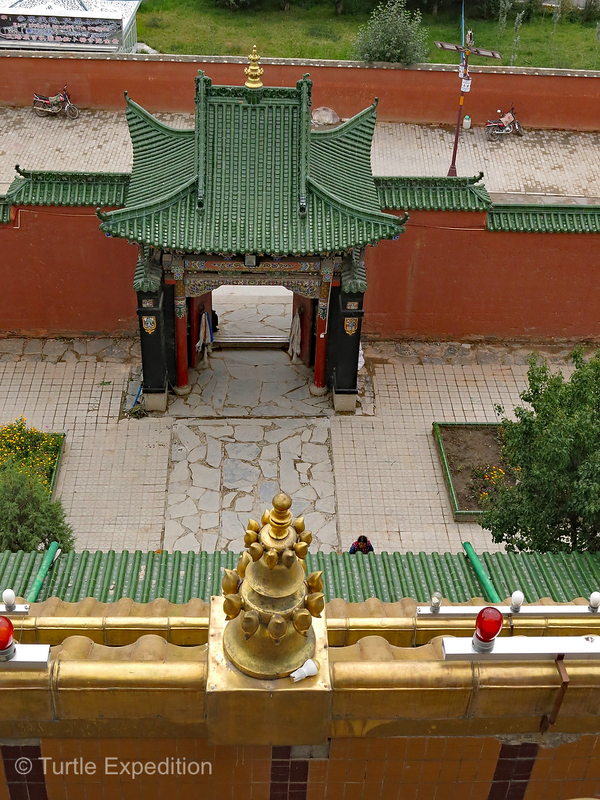 Views into the courtyard from the golden pagoda. 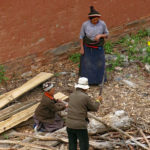 People were busy chopping firewood. 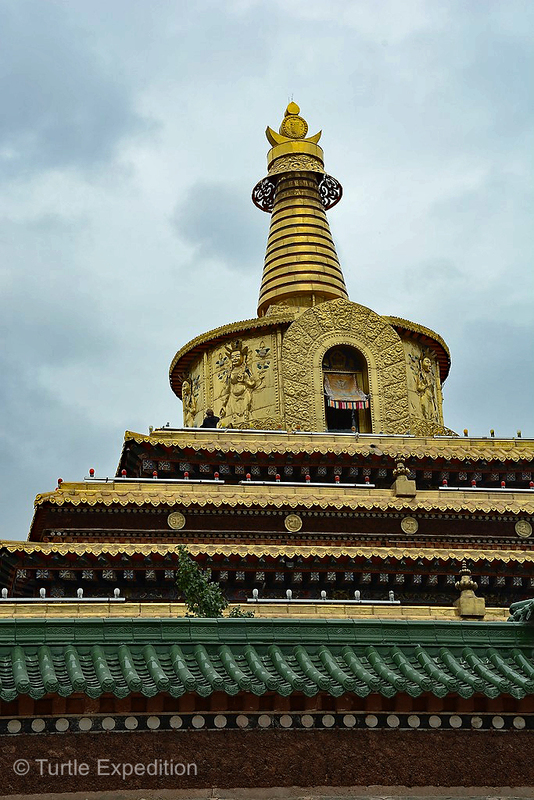 Views from the golden pagoda. 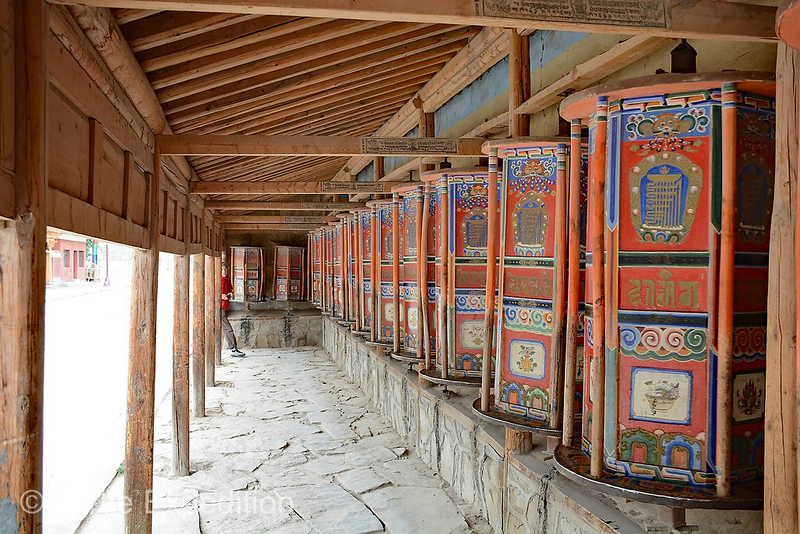 These beautiful prayer wheels were particularly ornate. 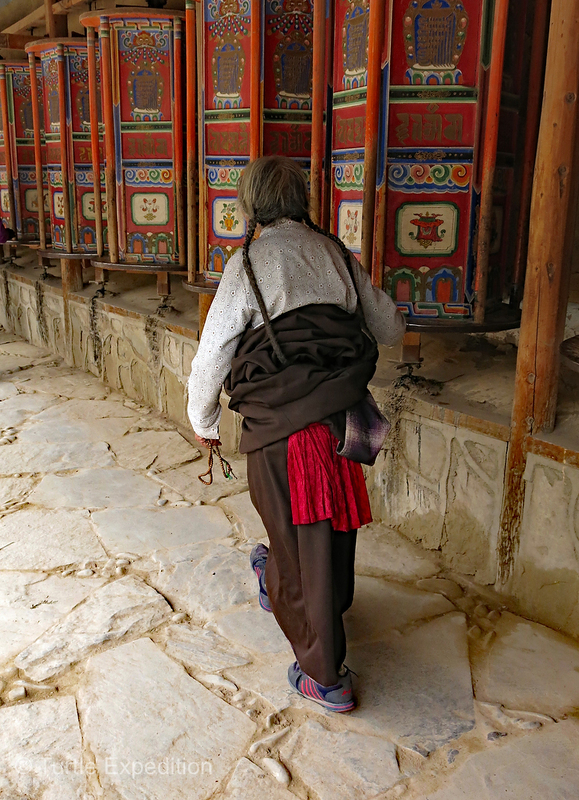 Walking along each prayer wheel gets turned. 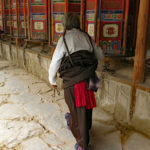 Just in case, we too walked along the prayer wheels and turned each one of them. 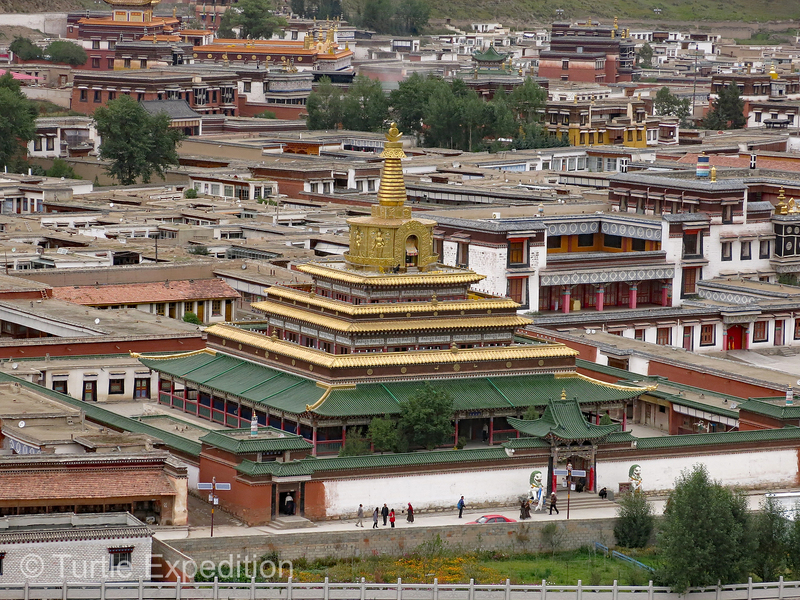 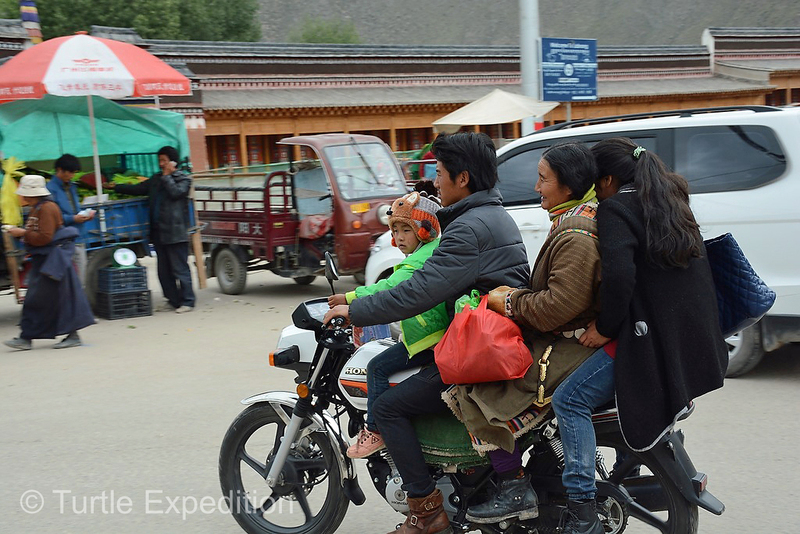 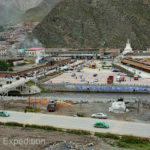 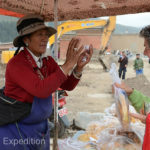 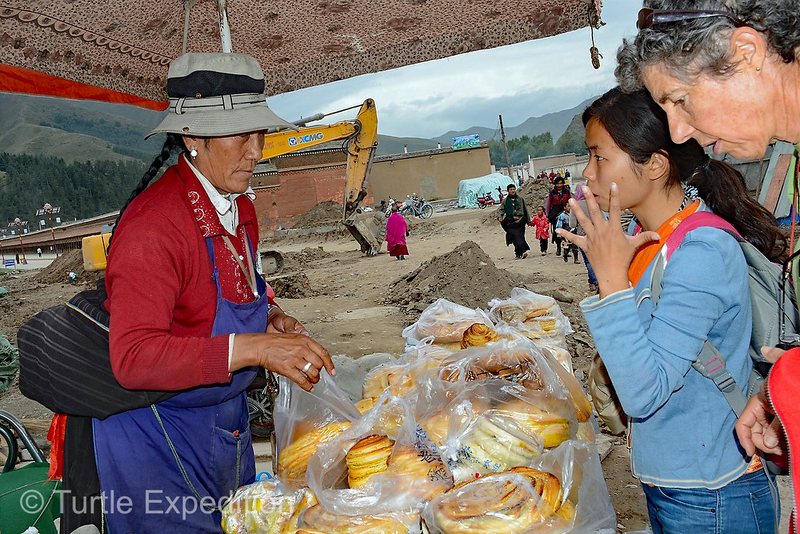 Thousands of pilgrims and tourists visit Labrang Monastery ever year. 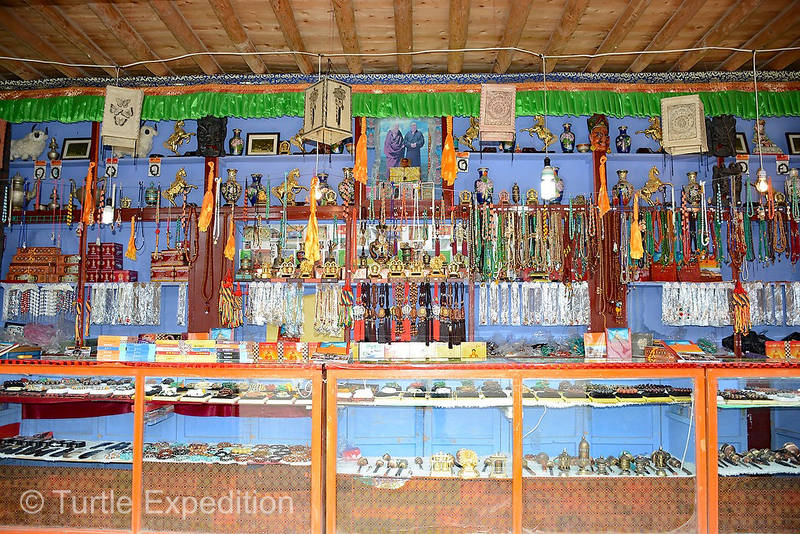 Gift shops have a huge selection of religious souvenirs. 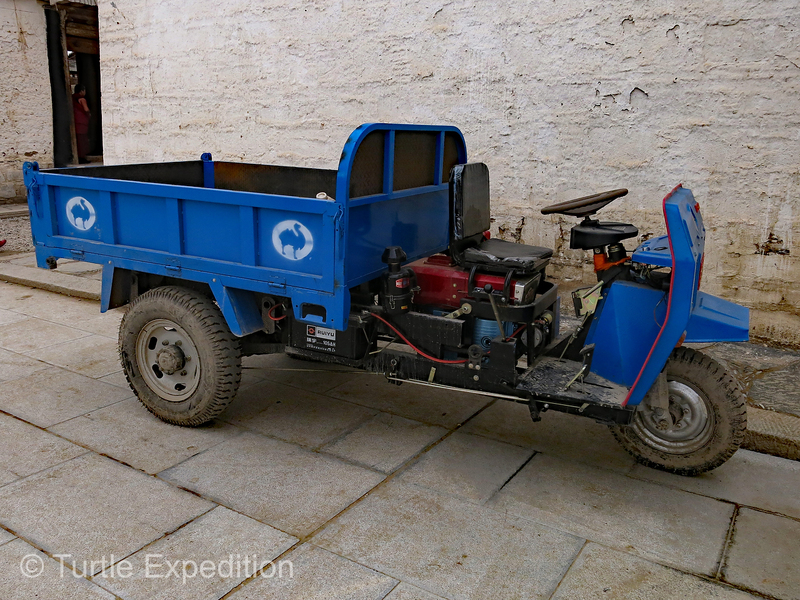 A brand new utility vehicle. 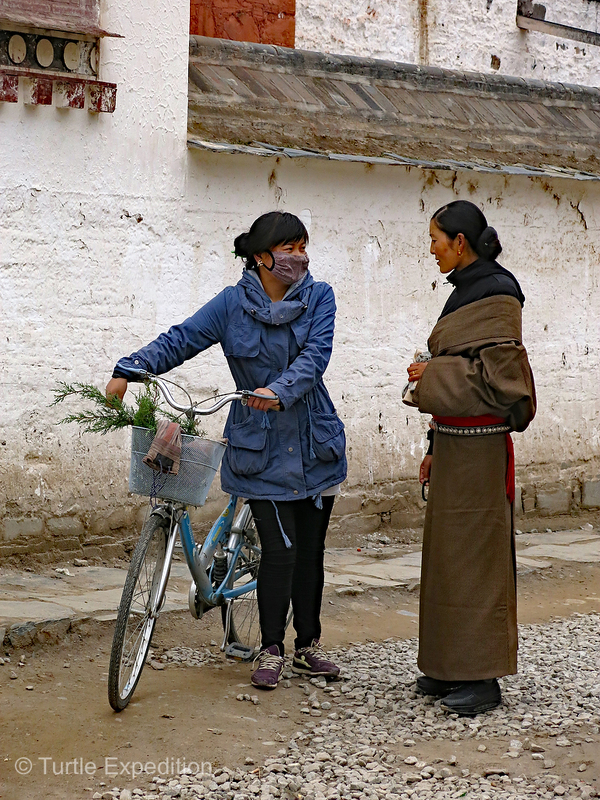 Just outside the entrance to the Monastery a woman was selling delicious cinnamon rolls. 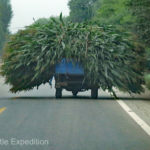 It looks like Green was verifying the price. 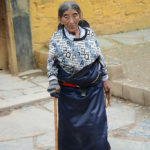 She did not speak the local language. 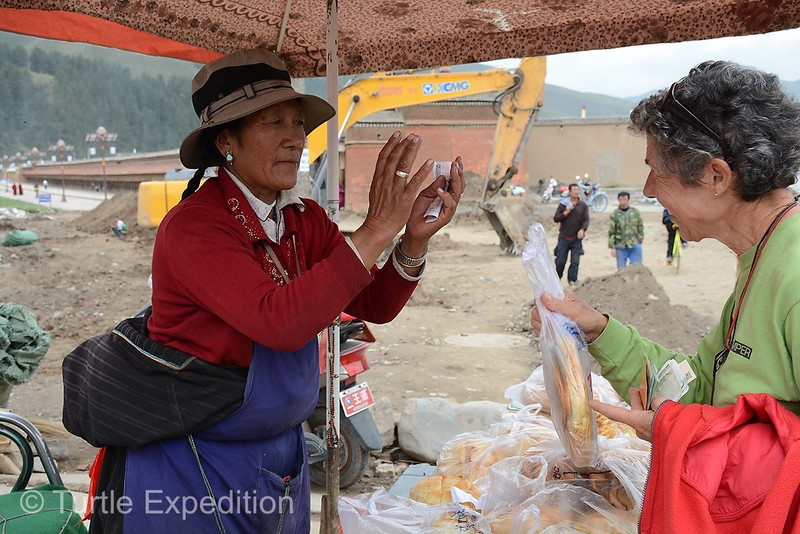 As Monika took her purchase the woman gave her a blessing of thanks. 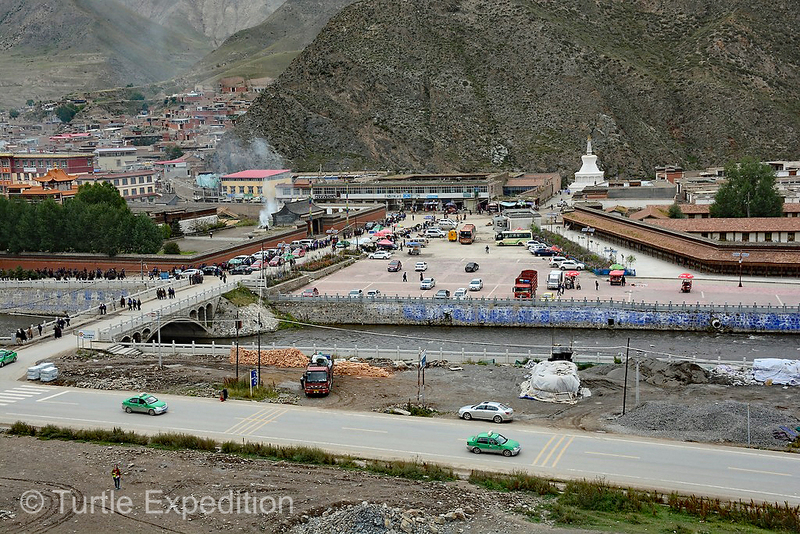 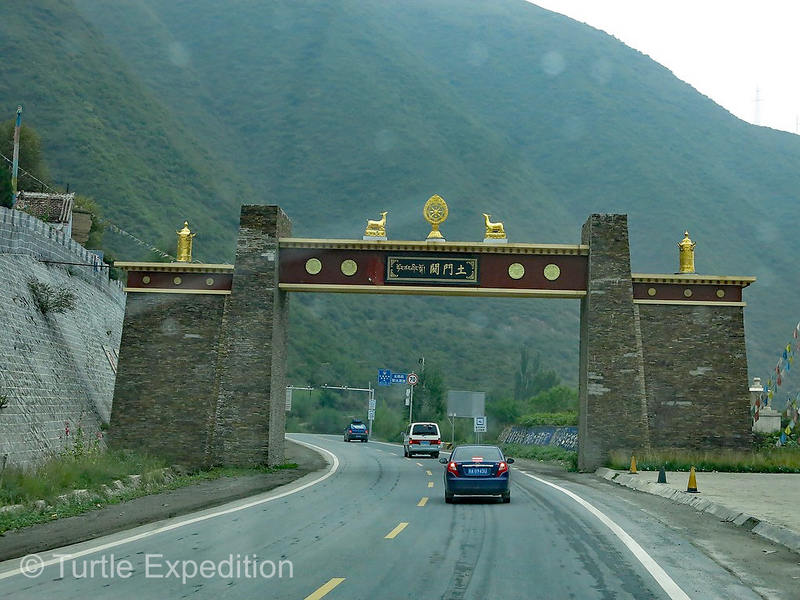 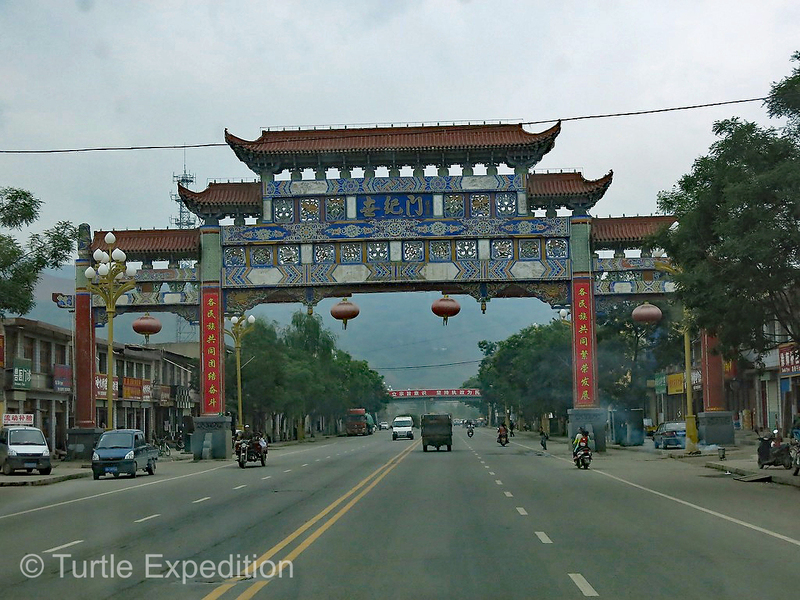 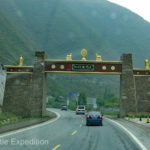 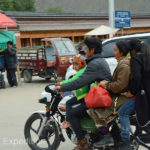 The main entrance to Xiahe was significantly better than the one we came in on. 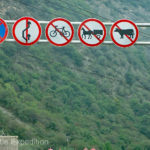 So where should we leave our cow? 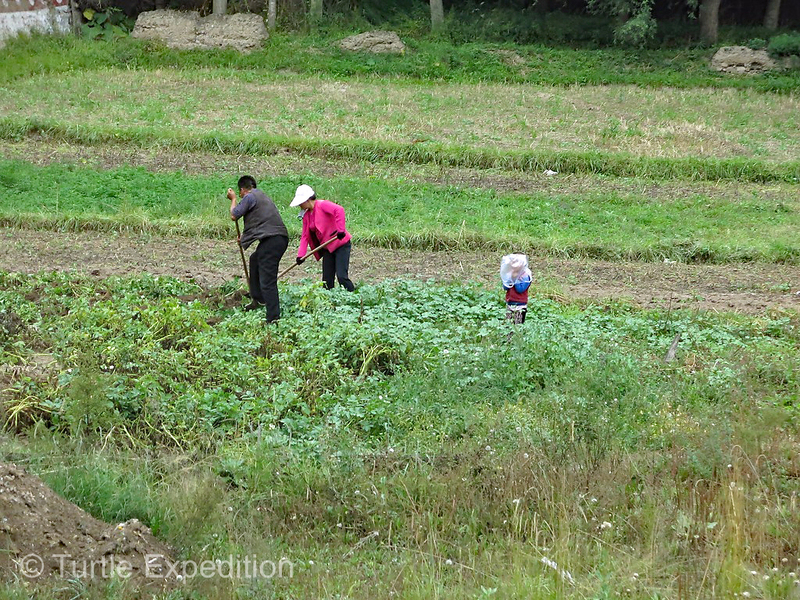 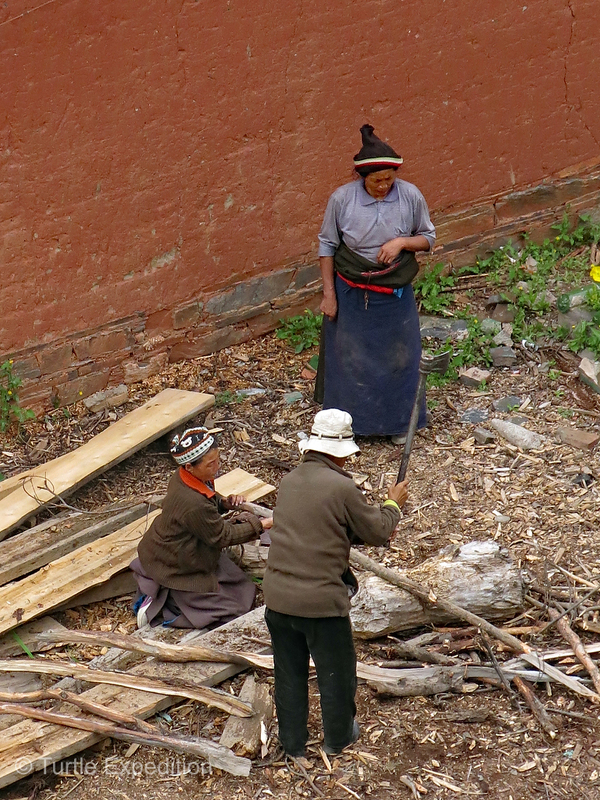 Locals were busy tending their gardens. 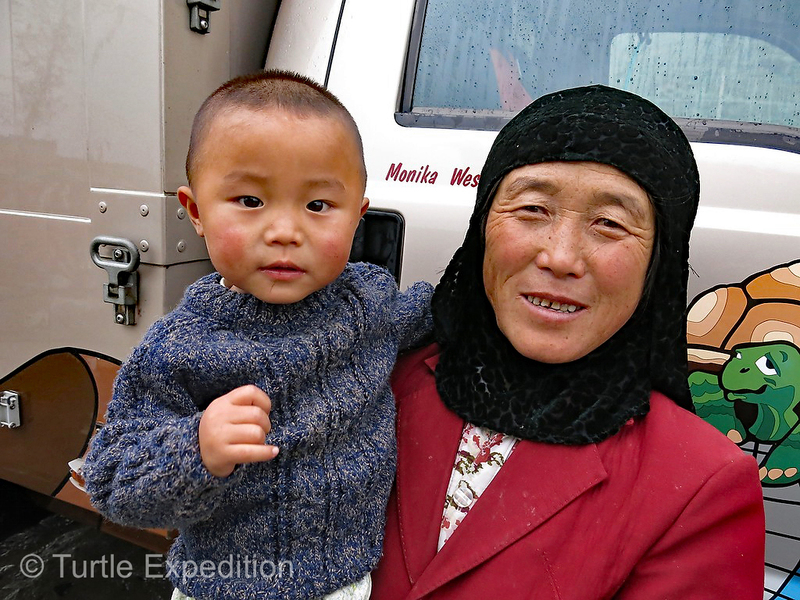 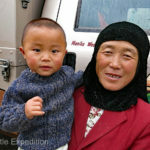 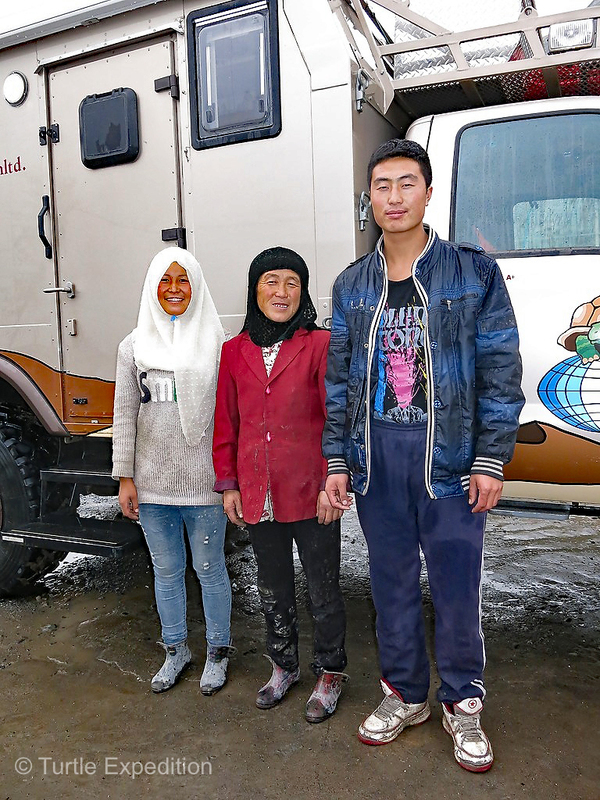 This nice Moslem family just wanted to see our camper after we ate a delicious lunch at their roadside restaurant. 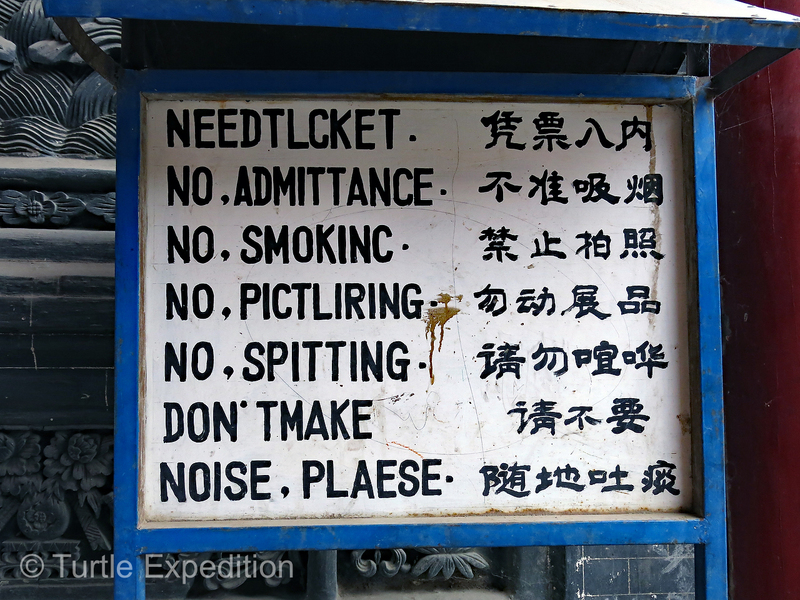 They were so polite we could not refuse. 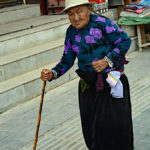 This grandma was especially sweet. 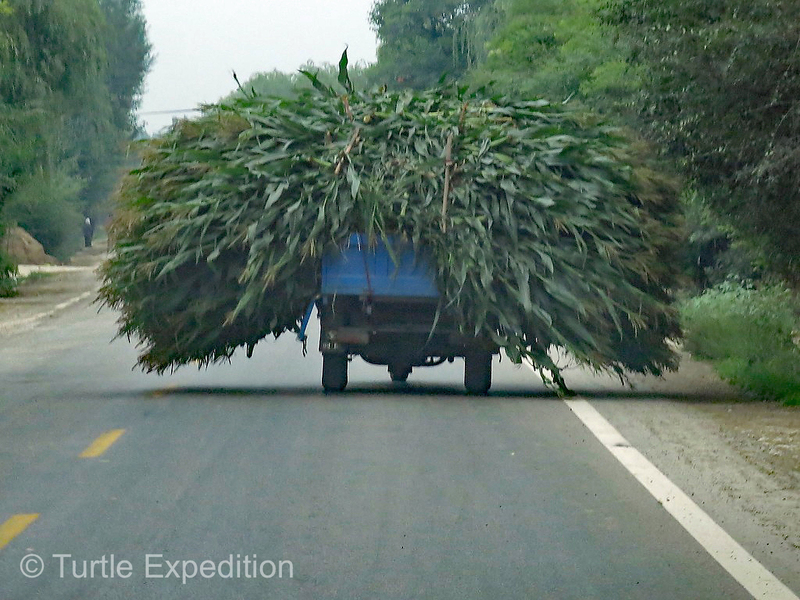 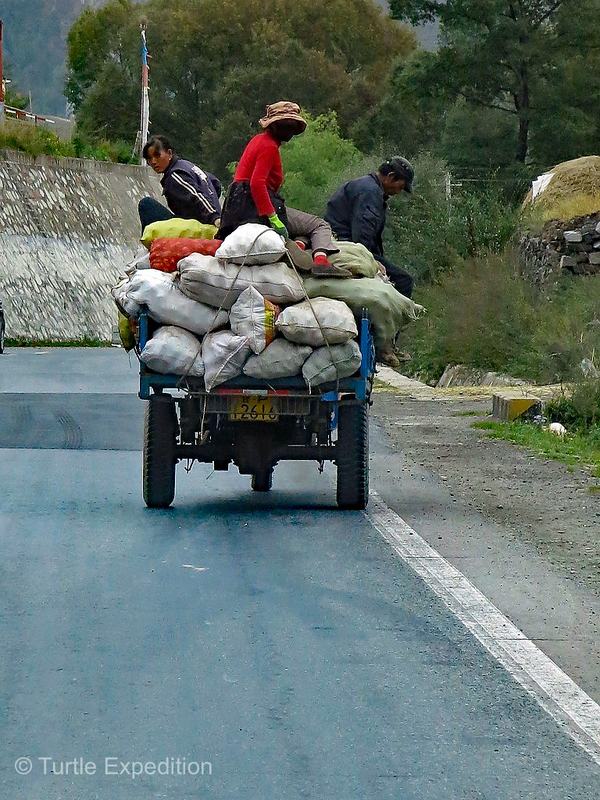 Back on the road, traffic was —-well—normal. 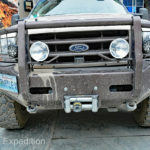 Thanks for keeping up with our blogs!